It’s just over two years since the Swinging Bridge in Souris was dismantled due to encroaching flood waters. 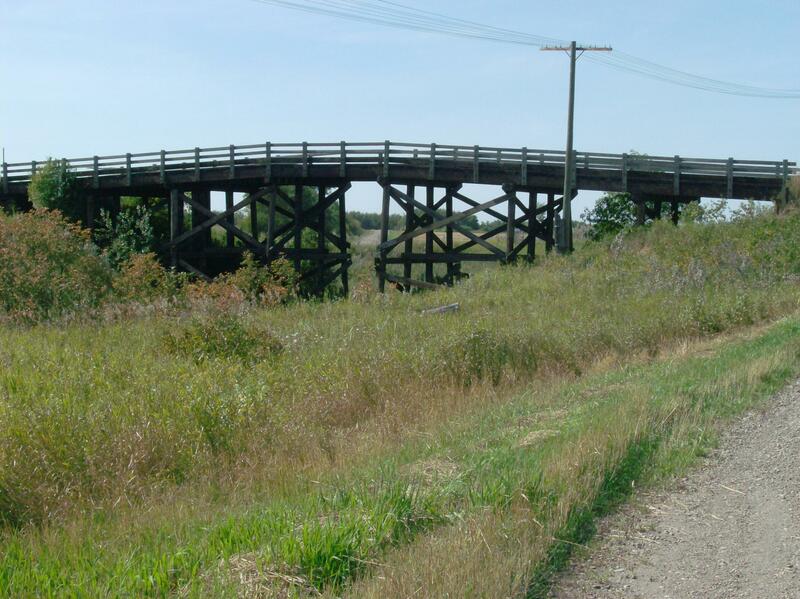 The Souris River was within four feet of the old bridge when it was decided to sacrifice the landmark lest, if it was swept away, it take with it part of the dike system protecting the town. A pretty and appealing little place, Souris relies on the tourist trade generated by the historic bridge – Canada’s longest cable-stayed footbridge at 178 meters – and suffered greatly without its main attraction. The new bridge has been under construction for over a year. This August long weekend marks the soft opening for the brand new swinging bridge, still the longest in the country. Its test run is in preparation for the official reopening on Saturday August 17, 2013. I will try to be in Souris for the opening. Next weekend I’m documenting the first annual Carberry Heritage Festival, Friday and Saturday August 9 & 10. More on that here. This is a well shot 3:52 video of the drive over the Atlantic Road off the coast of Norway. The highway links several islands in a archipelago that stretches into the Norwegian Sea. Just over five miles long, on a blustery day, it would make a formidable commute to work. Click the pic and see for yourself. Yet another 33 degree C. (over 90 F.) day in a perfect summer which demanded a short jaunt out of The Hive onto the lake bed southeast of Winnipeg! There was enough breeze to slake the heat. The air was full of chaff from plundering combines wrapping up the 2012 harvest. 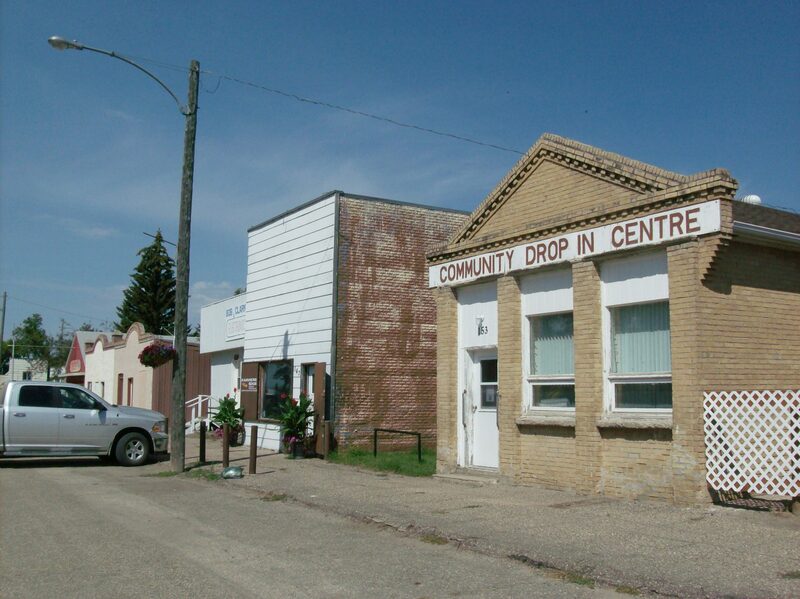 Three MCC thrift stores hit along the way – Niverville, Grunthal, Steinbach – with zilch to report from all of them. Surprising! I paused in Sarto to see if Willow Plain School was open. It wasn’t. 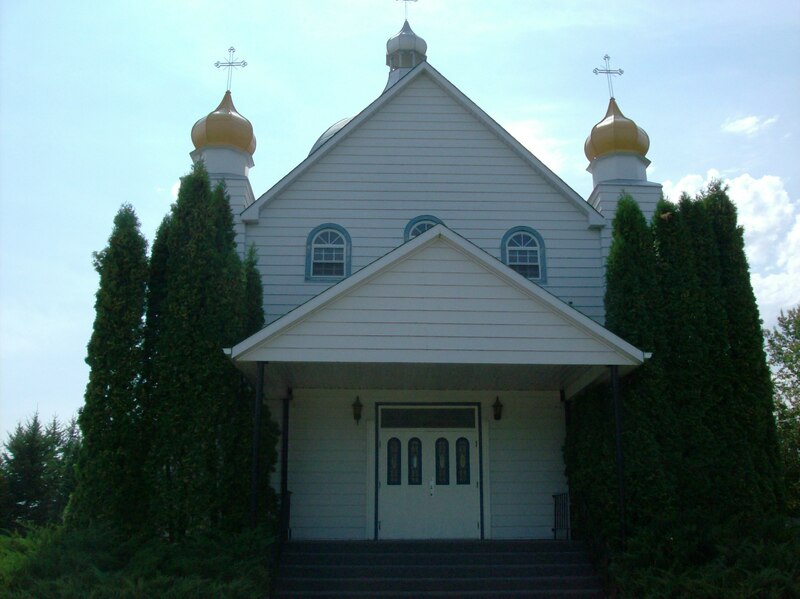 Instead I talked to Jake who was restoring the traditional blue window trim to St. Michael’s Ukrainian Catholic Church in Sarto. Here’s Jake at work. 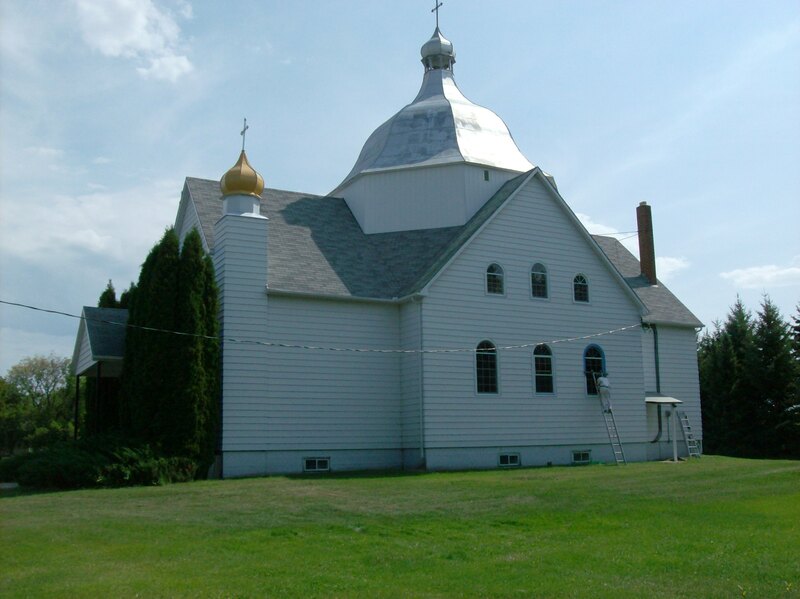 You’ll notice the onion dome at the front of the church is a yellow colour, part of its new coat of paint. Jake thought he’d be repainting them. Here’s a view of the church with its yellow domes. Sarto is on Provincial Road 205. 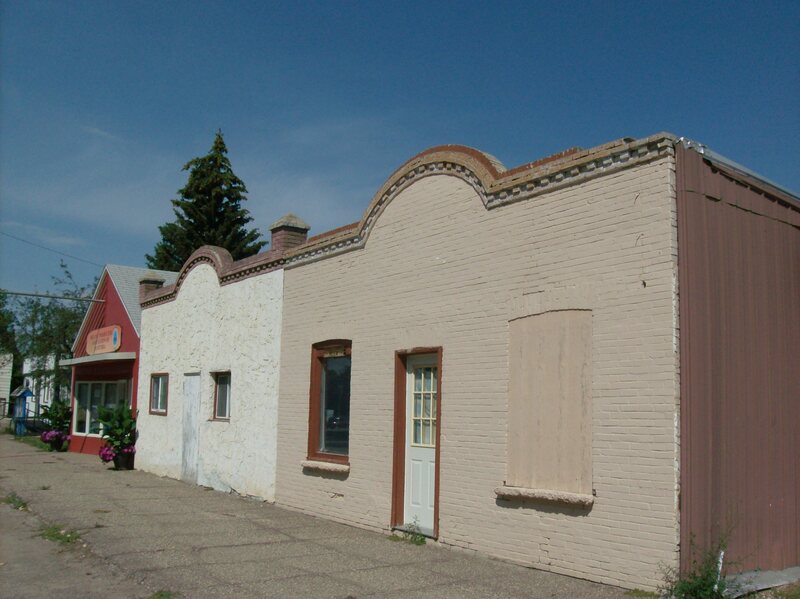 As I drove east along 205, I saw a number of unusual small buildings along the road about a mile west of Hwy #12. They turned out to be elaborate sheds. Called estate sheds, they are definitely not the kind you buy at Canadian Tire. Some resembled cabins, others playhouses and barns. 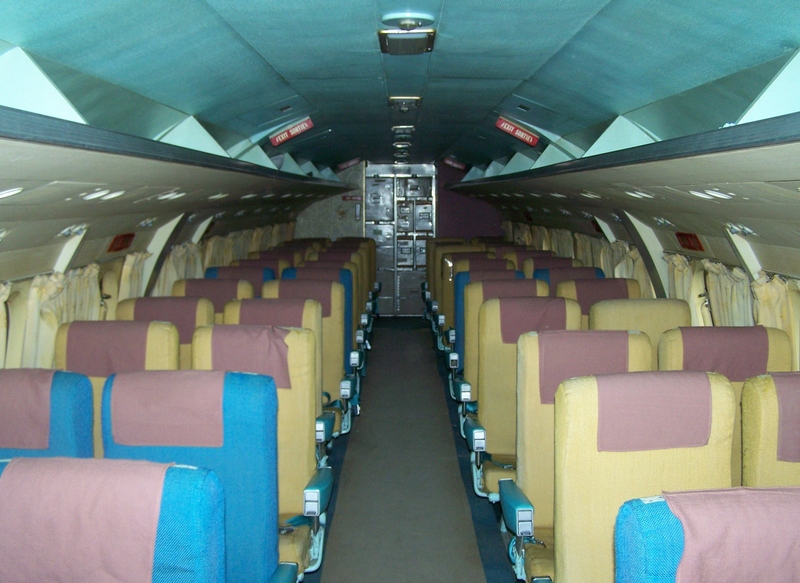 All the designs had certain delightful, whimsical features. 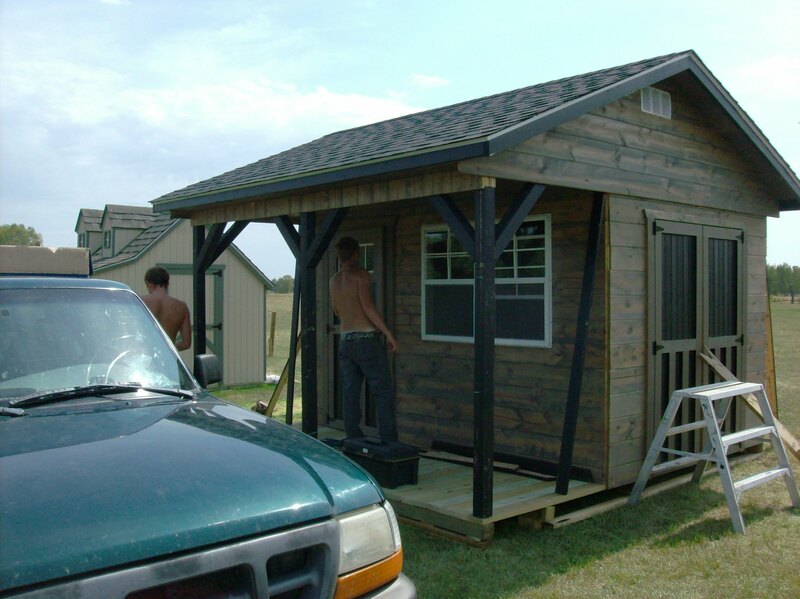 Two guys were working assembling one of the cabin sheds in the heat. Henry and Ernie told me they came prefab and there are dozens of styles to choose from. All styles have double doors, either on the side or front, to easily access the shed and move equipment in and out. 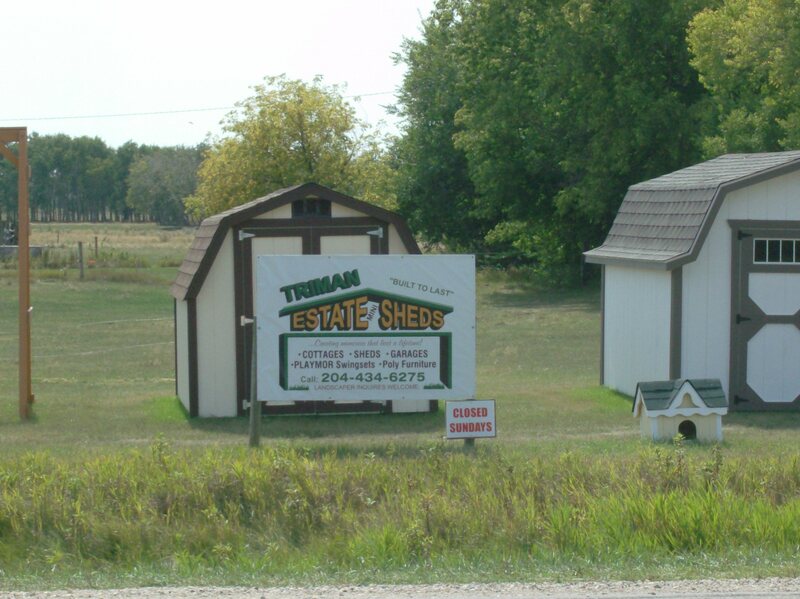 The company is Triman Estates Mini Sheds in Neepawa, MB who can special order the sheds from Miller’s Storage Barns in the U. S. They come in dozens of sizes and shapes, colours and you can even customize them yourself. 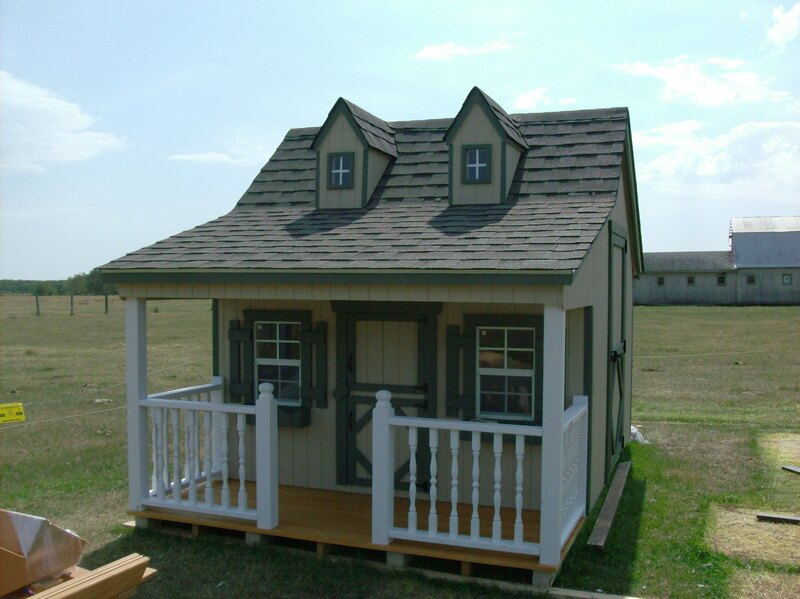 Find out more about the company at http://www.playmorswingsets.com/playmor-swingset-dealer/triman-estate-mini-sheds. 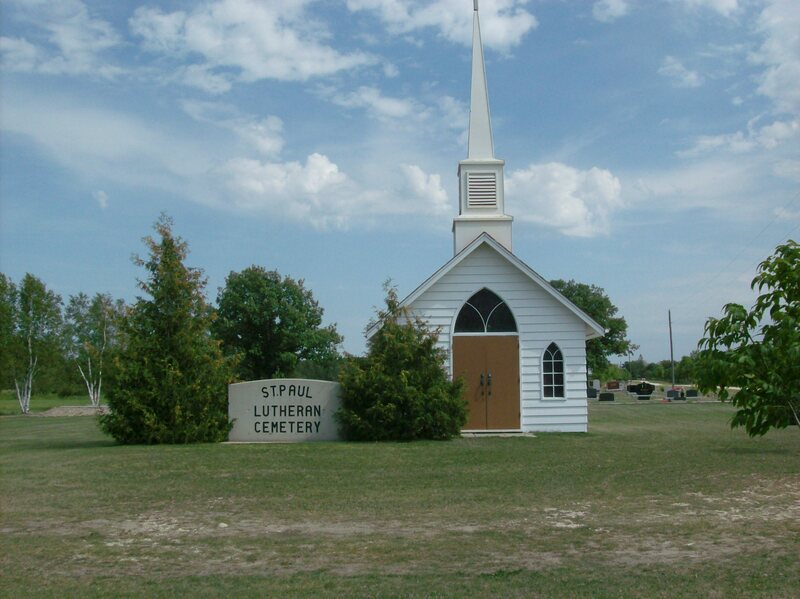 Three kms south of Steinbach next to Hwy #12 is St. Paul’s Lutheran Cemetery. You can’t miss the tiny white chapel with the red roof, pointed Gothic windows and tall skinny steeple. In back of the church under shady oaks rest dozens of local parishioners. 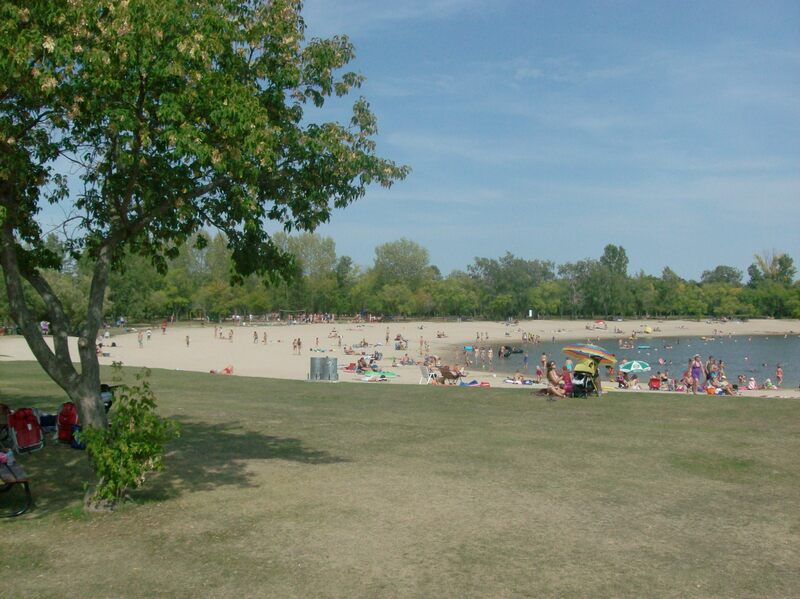 The beach at St. Malo Provincial Park was thronged with sunbathers, swimmers, beach volleyball players and people escaping the heat. 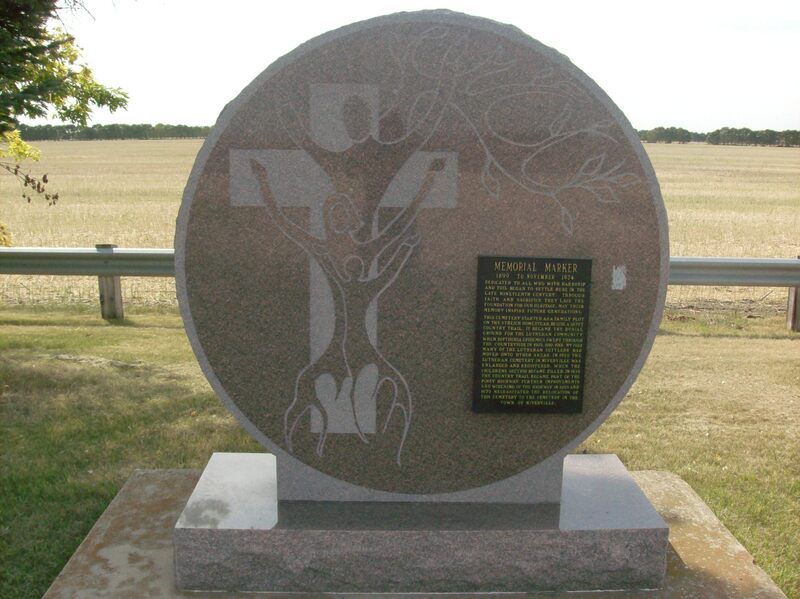 This memorial to the deceased who have been shuffled around while the modern world “progresses” can be seen next to provincial road 311 half a km south of its junction with Hwy 59. 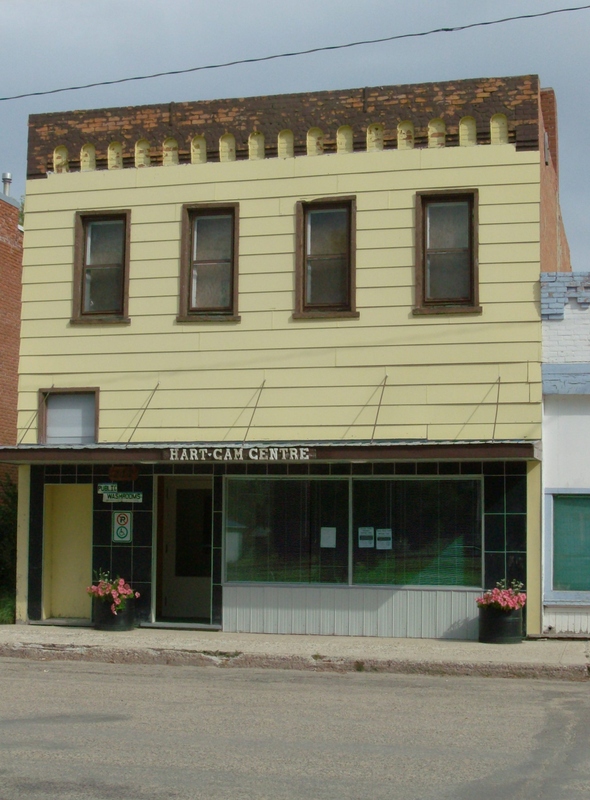 In downtown Hartney, MB, prominent on a corner, stands this lovely old two-storey brick building. The series of arches formed by the brickwork under the cornice is called an arcade and Hartney has several arcades that attracted my heritage geekeye. You know the one. Anyway, this is a particularly precise arcade, mixed and measured into the corbelled brickwork which continues along the exposed side of the place. 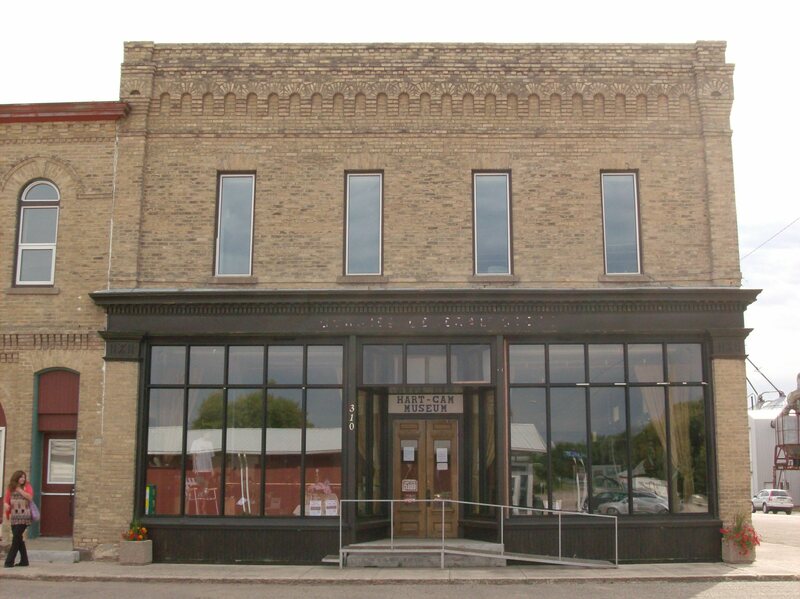 The craftsmanship of the masonry overall on the building is exceptional, the crown on the end pilasters an excellent example. Today its broad showroom windows light the Hart (ney) – Cam (eron RM) Museum. Incidentally, this building served as the bank location in an entertaining little movie called The Lookout Try to watch it. Just down the block from the museum is another arcade. Cruelly painted and indulging itself in mid-peel mode, the brickwork still shines through. If you click and zoom the pic you can see that the original intent of the artisan who laid this arcade cannot be diminished by mere paint and hue. 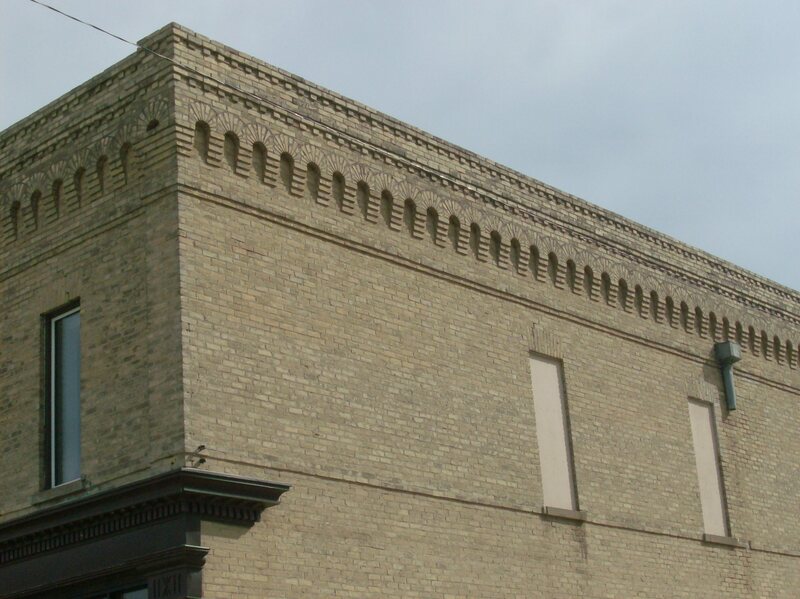 Right next to the museum is another fine brick structure prompting awe with its deft and detailed design and execution. The three arches over the rounded windows form a sweeping, open arcade that gives the facade breath and life, “articulating and disambiguating the fenestration of the ground floor.” The main floor is a whole other study in arches, dominant and submissive, abetted by alluring brickwork. That’s another post for another late night. 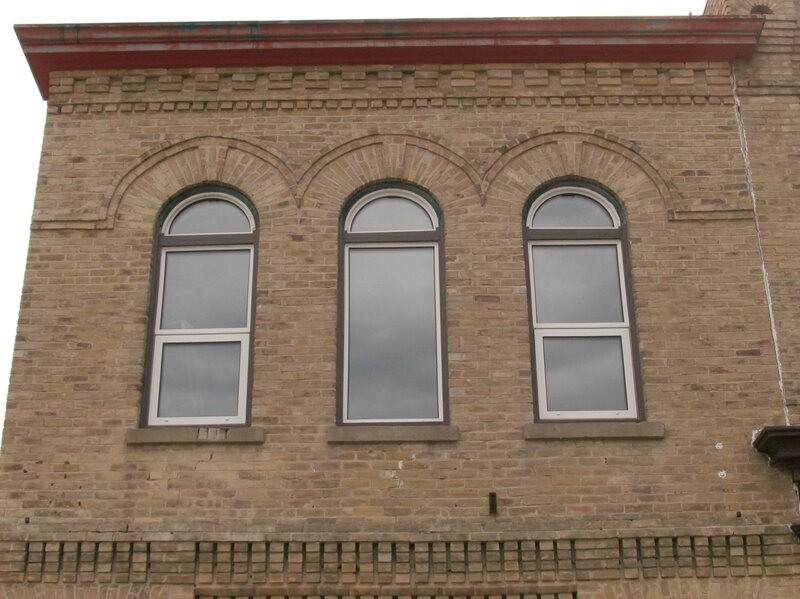 Corbelling, dentils and aviated keystones enhance the arcade, the quality of the craftsmanship still evident and whole, a century after construction. 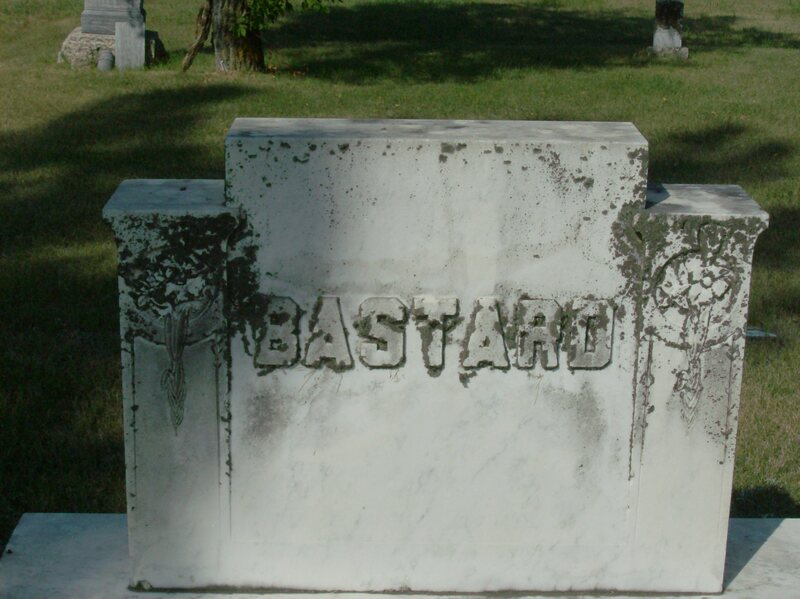 No, it’s the family name. I am always attracted to exceptional brickwork, especially when it contrasts with the metal cladding favoured in many towns. The skyline of Miniota has a few shapes that resonate back to its birth and subsequent enterprise, its boomtown moment, a worthy endeavour and one to be encouraged elsewhere. 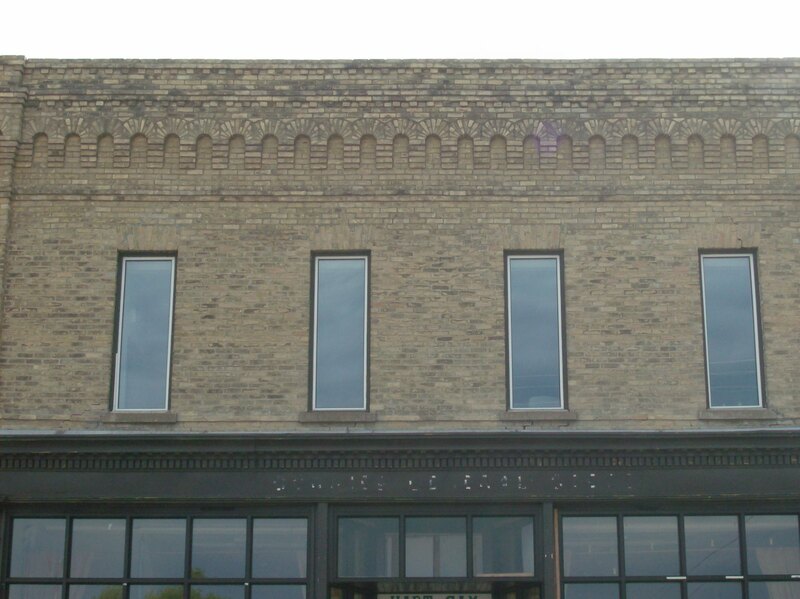 One side of Miniota’s main drag has a series of facade rooflines that are replicated in brick. 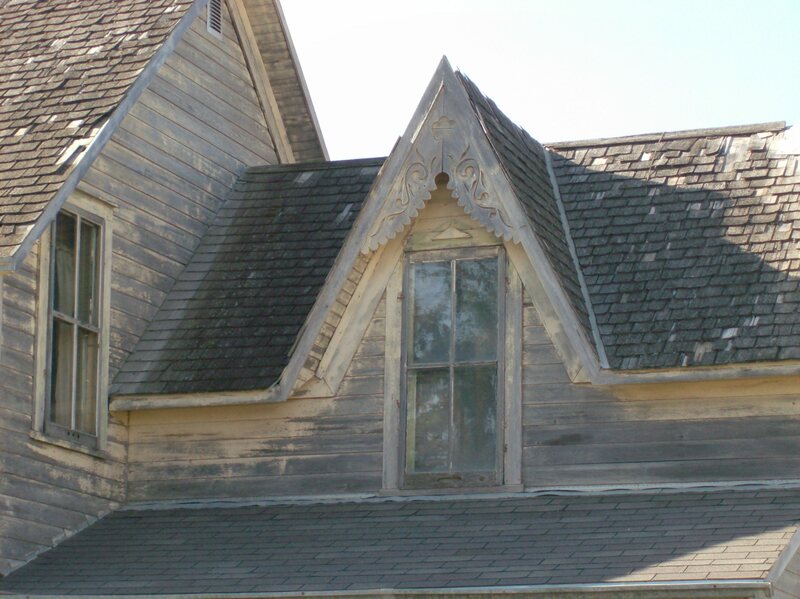 As in this picture, there are pointed and rounded shapes using header dentils and cornice, soft corbelling and interesting finishes and colour choices. Just down the block two more one-storey brick commercial buildings constructed around the same time with the rounded brickwork and again interesting finishes. Down the street is this official looking building with the pointed facade and the infrequent double dentil, the corner stepped-brick brackets, again infrequent and the American bond of the bricks inside the surmounting pediment, contrasting with the running bond of the rest of the pile. It has a story or two to tell, I would say. Yup, usta be Uno. Just one house and this sign now. 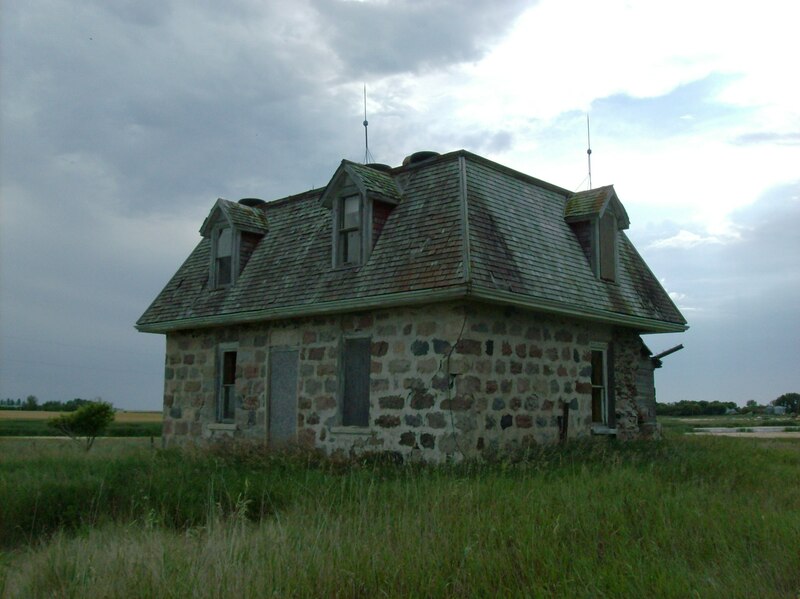 Out there, lonesome, Mansard roof tumbledown, howling wind, rotting, swallows, lightning-ready, the rods, gulps, stones, falling away, sunken, sunk. 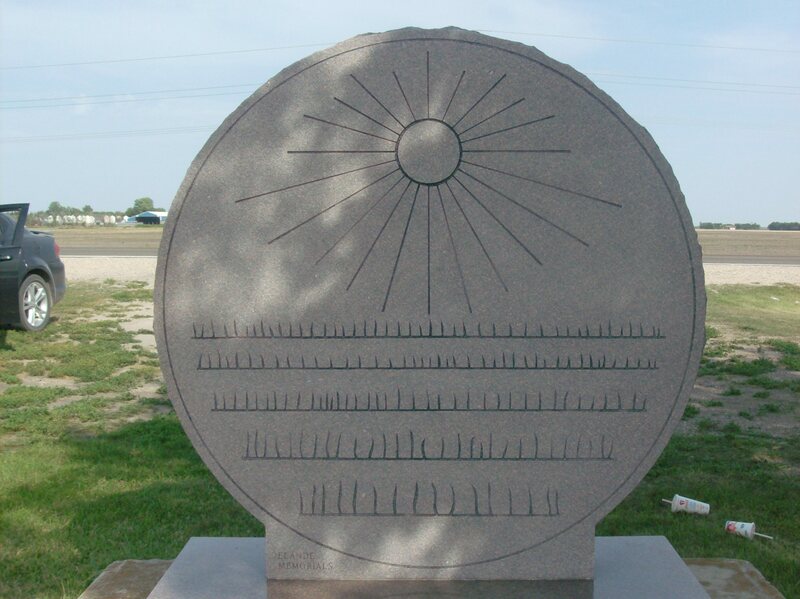 Find it along MB Hwy 21 south of Hartney. Expect more visually inspired stuff from this place…all hush, hush for now! More restoration work happening in Spruce Woods Park after last summer’s devastating flood. These are straw mats held down with webbing meant to restore some green growth along the road to stabilize the ditches. The thick grey floodcake that covered large areas of the park left by last year’s floodwaters has been hauled away and these mats secured in place. Some growth is already occurring. I’ll report later in summer on the progress of this method. I’m always on the road, passing back and forth through the vanishing point, getting out of the mighty Avenger, smelling the fresh prairie breezes, feeling the hot sun on my flesh, always curious about what’s around the next corner, ever seeking the ‘what was that? !’ moment and often finding it. Every mile a safe mile. Last year at this time the Assiniboine River was in full flood, threatening wide areas of Manitoba. The surging water had already taken out the infrastructure for the Stockton Ferry, a small pull ferry that spans the Assiniboine linking two gravel roads. 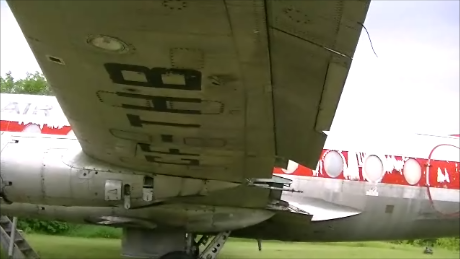 Watch last year’s video report. 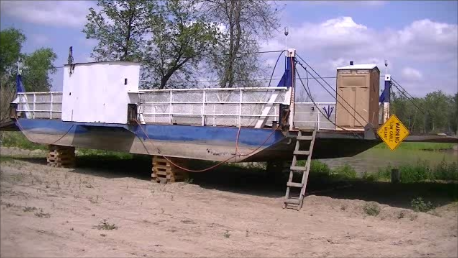 At one time there were 150 river ferries operating in Manitoba, most of them like the Stockton Ferry – able to carry one or two car/buggy passenger loads and still remain more economical than bridge building. Operating since 1887, the Stockton Ferry was the last river ferry in Manitoba. As you can see in the picture and my 2012 video report, the ferry is still beached. Flood damage was substantial but work is underway to reconstruct the system. No word on when the service might be operating again. 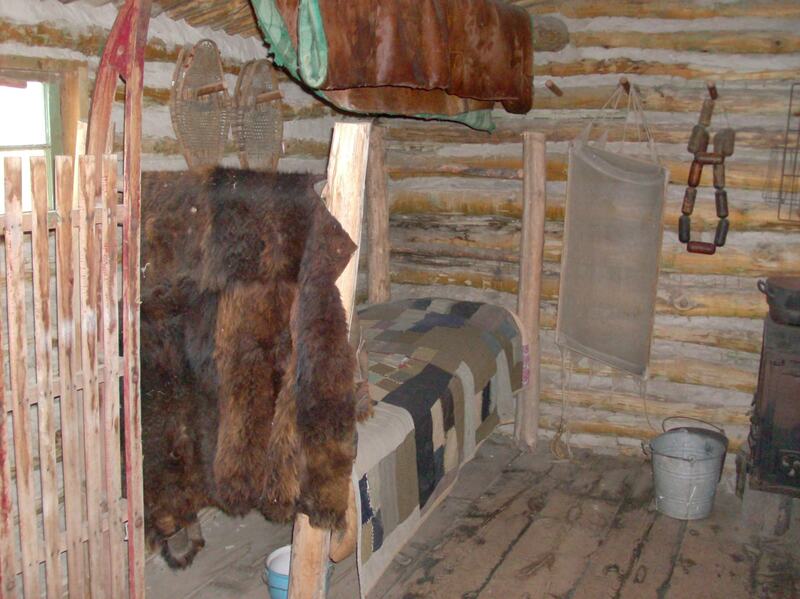 Fort la Reine Museum in Portage la Prairie is one of the most progressive and inventive museums in Manitoba. Their Lennon/Ono exhibit last year drew the curious. Always looking for new wrinkles to make use of the museum’s collection, this week I received an email from them suggesting “get married at our museum.” What a novel idea! They have all kinds of interesting venues to actually hold your wedding including a couple of heritage churches. You can get wed elsewhere and use the museum as the setting for your wedding photos with various amenities available. I Do details are on their website. Even if you’re not getting married the museum is a worthwhile stop, just off the TCH on the east side of Portage. Under an overcast sky, the mighty Avenger and I took a spin westward on the TCH to Portage la Prairie last Friday. A quick shop of PLP’s thrift shops, it has three, yielded just four classy 1950s glass tumblers @ $1 each at the MCC. A slow cruise through Island Park, literally a park on a large island in the middle of the Assiniboine River, and a pause for a Horts got me homeward bound. But not before a stop at the Fort la Reine Museum on the east side of PLP. The gate and all the buildings were open but Tracey Turner, the museum’s curator and manager, said they don’t officially open until Monday, May 7. 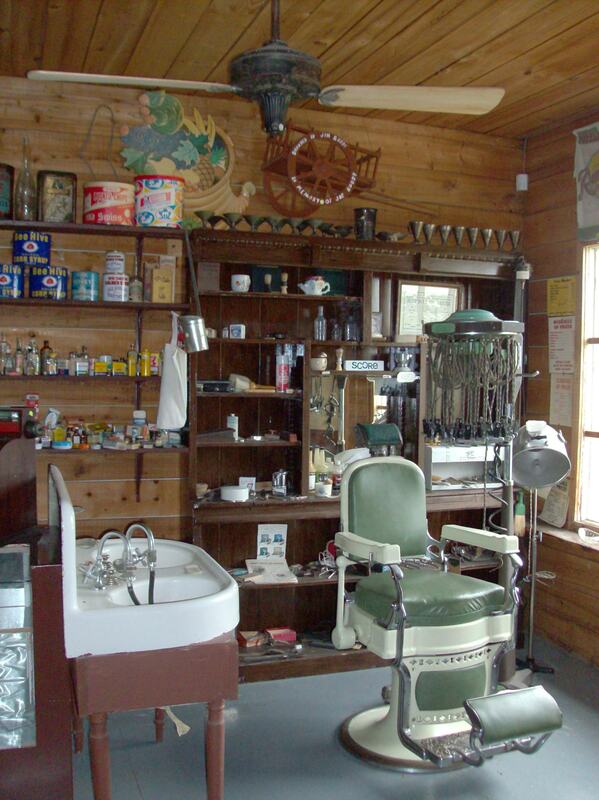 The evil-looking device next to the barber chair is an early electric hair curler! I spent half an hour roaming the sprawling museum which is comprised of 27 different pioneer buildings and items brought into the site creating the feeling of a village. Heritage purists disparagingly refer to these kinds of museums as “petting zoos.” They believe that heritage value exists only when the place is in situ and that value disappears when a building is moved. Not being a heritage snob, I like the clustering of buildings from various times and uses. 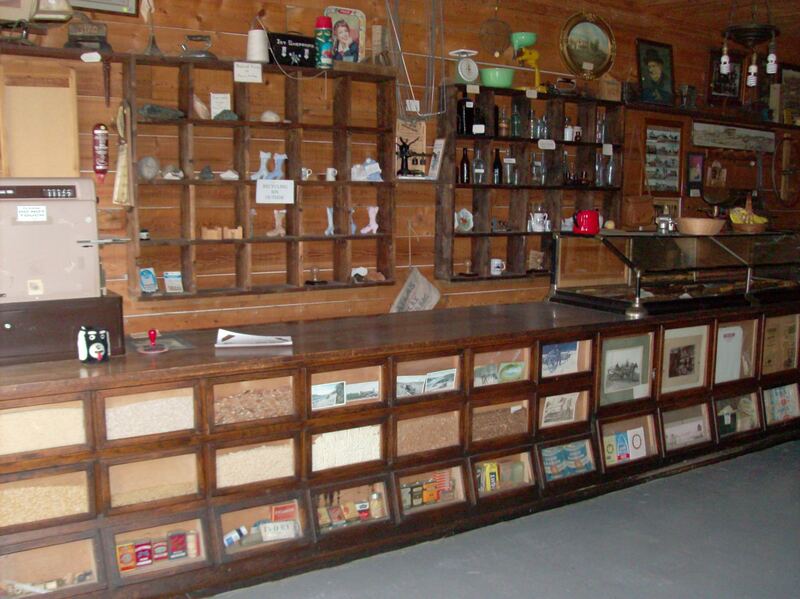 Fort la Reine Museum displays all the qualities that I appreciate in a museum. Such as? 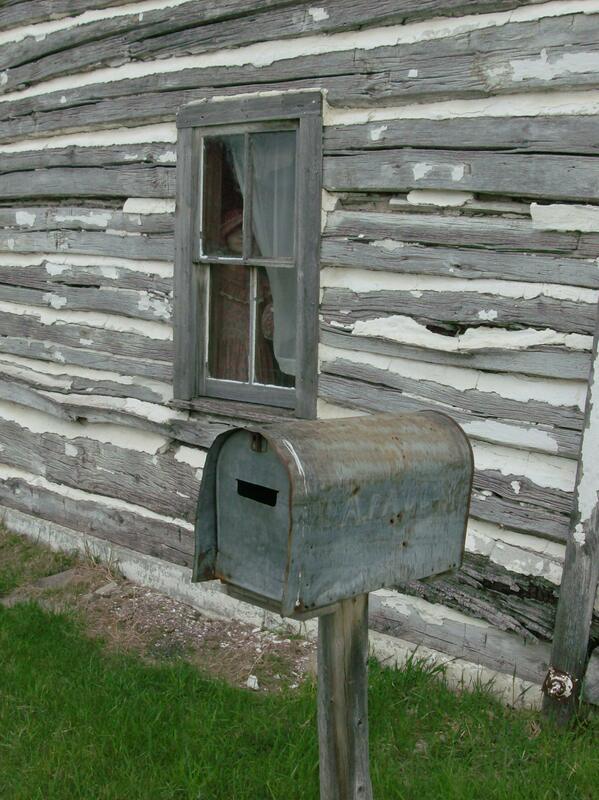 The pleasant feeling of an early pioneer village. 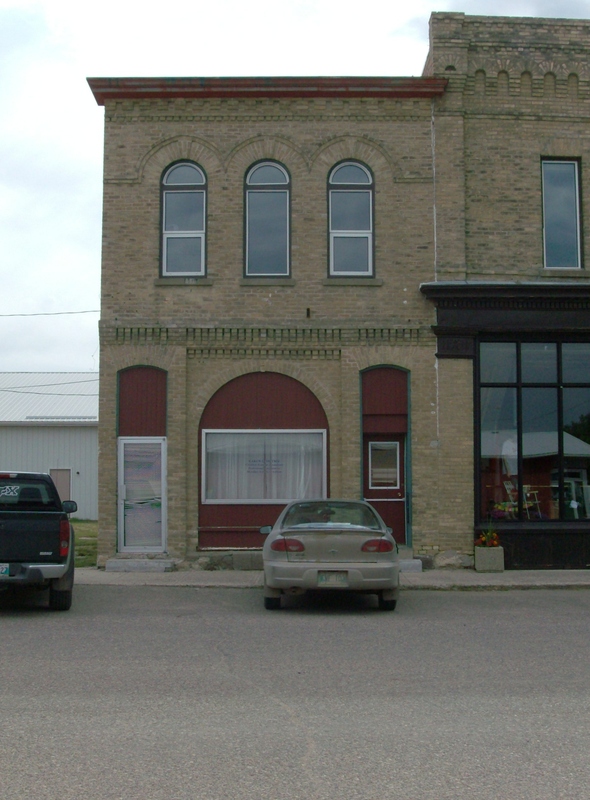 When you enter there is a row of old buildings as you might find on a main drag of a prairie town around 1900. 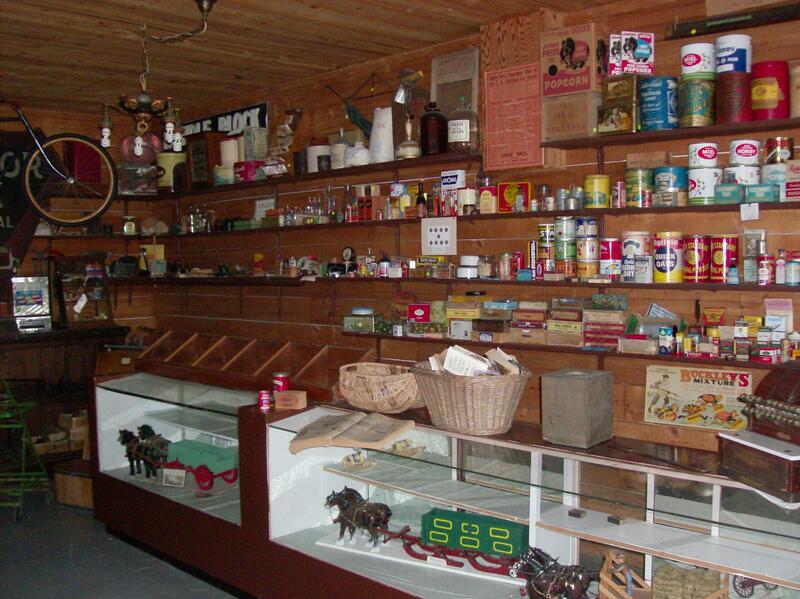 The pictures at the top are of the interior of the museum’s general store. 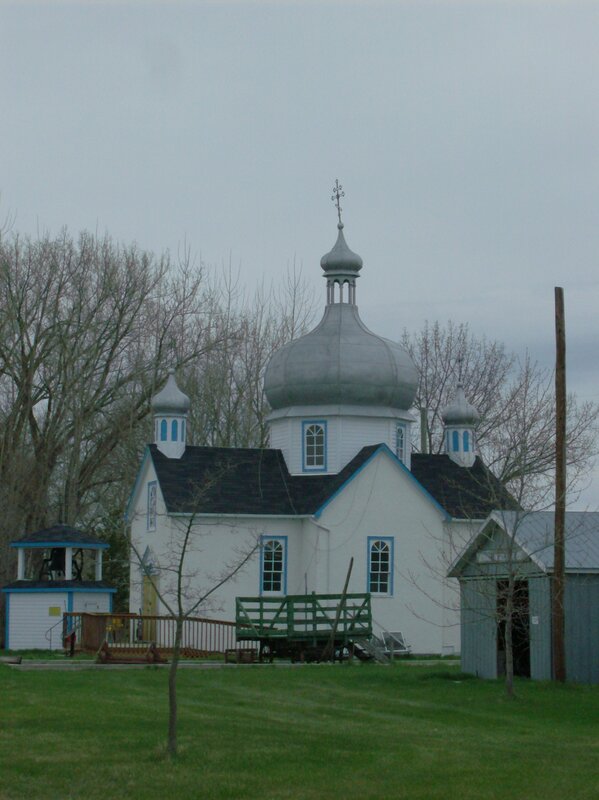 Also on site are a replica of Fort la Reine (the original was built by La Verendrye in 1739), a red barn, St. Nicholas Ukrainian Orthodox Church, fire hall, print shop, school, doctor and dentist’s offices and West Prospect Church. 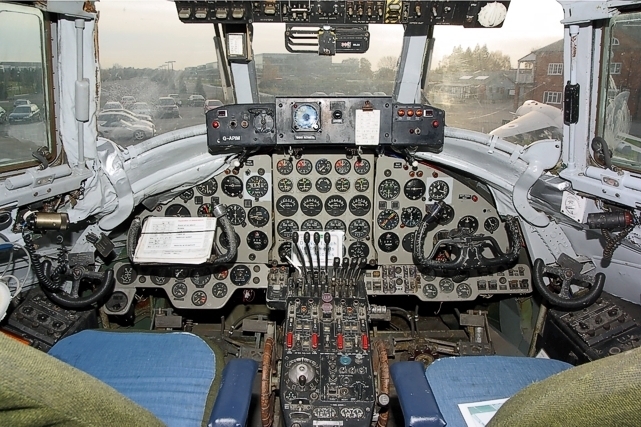 Specific items on display include a York boat, Musketeer aircraft and several houses. The houses range from a reproduction of a trapper’s crude shack, the Paul family’s log house built in 1879, the Hourie house built in 1890, the Burton house from early 1900s and the Douglas Campbell home. 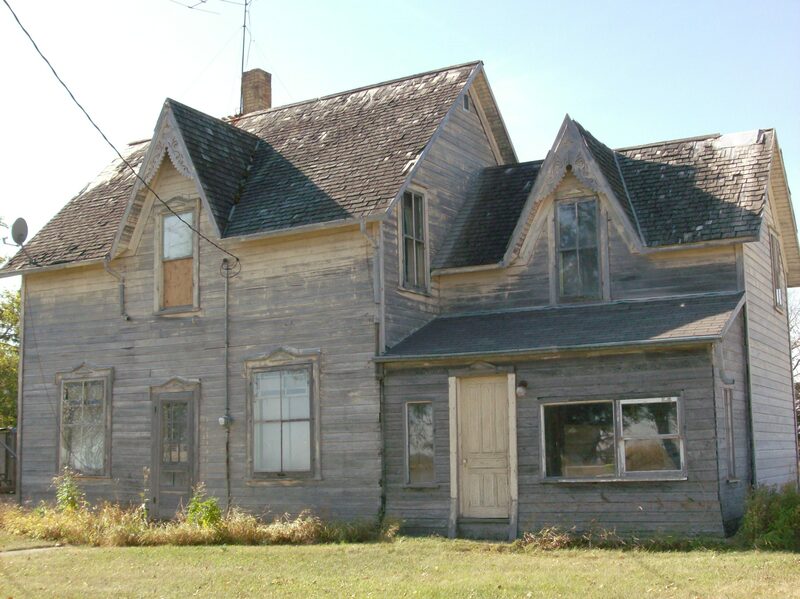 Each house represents an improvement in accommodations and demonstrates the development of prairie architecture from rude shacks to elegant Queen Anne Revival style homes. The museum has a significant railroad component which includes the private rail car of Sir William Van Horne, the flamboyant general manager of the CPR, a superintendent’s car, a signalman’s shack and a caboose. Another reason I like this museum concept is, without it, most of these buildings would have been destroyed, converted into sheds and granaries or left to rot into the prairie. 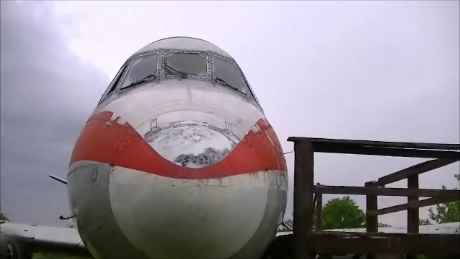 Even though they aren’t in their original location, they do still exist thanks to the museum. Tracey Turner told me they are doing something new this summer. In July and August the museum will host an exhibition about the various traveling vaudeville shows that crisscrossed the country in the early 1900s. Called Voices of the Town, Vaudeville in Canada, the exhibit is on loan from the Peterborough Museum and Archives. I’ll provide more information about the exhibit when its opening day draws nearer. 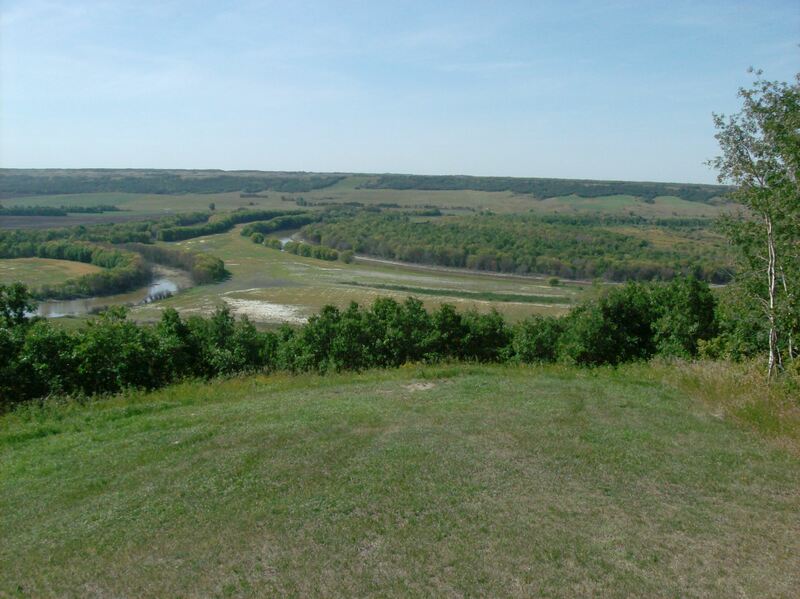 For thousands of years the valley of the Assiniboine River provided food, water and shelter. 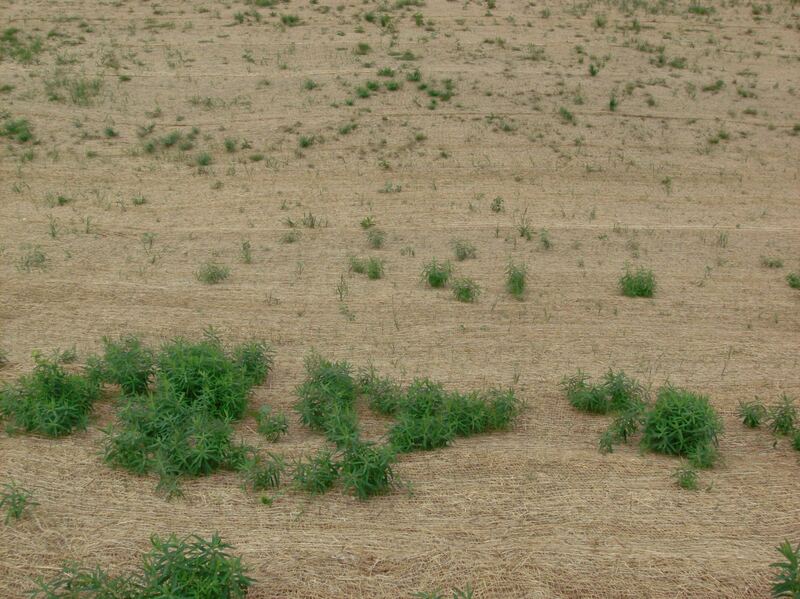 Along its banks are numerous known and unknown former campsites where evidence of habitation can be found. 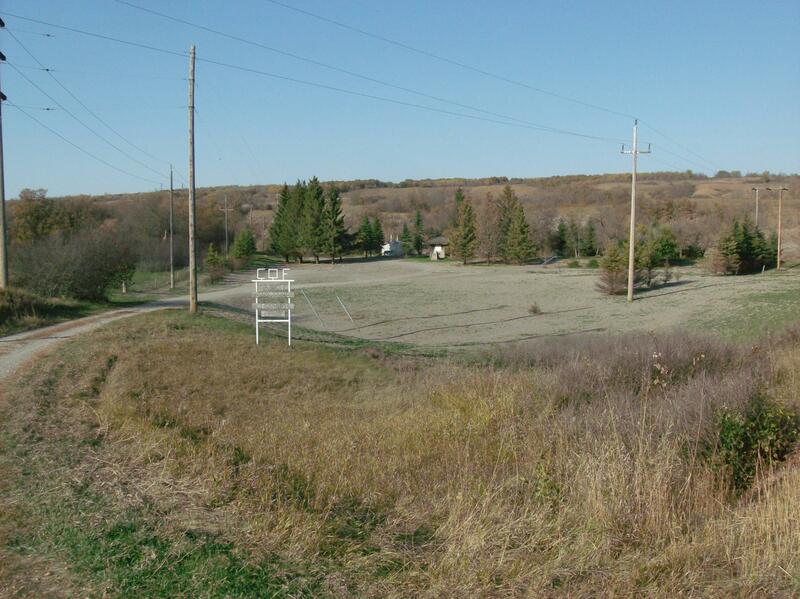 In 1992, pipeline crews discovered a rare campsite on the banks of the Assiniboine near Miniota, MB, rare because the site was used only once before it was covered with river sediment from flooding. The archies thoroughly dug the site and preserved dozens of artifacts dating back 1000 years to the Avonlea people. Today a viewing platform and information board perched high above the river offer access to a millennium of river history. 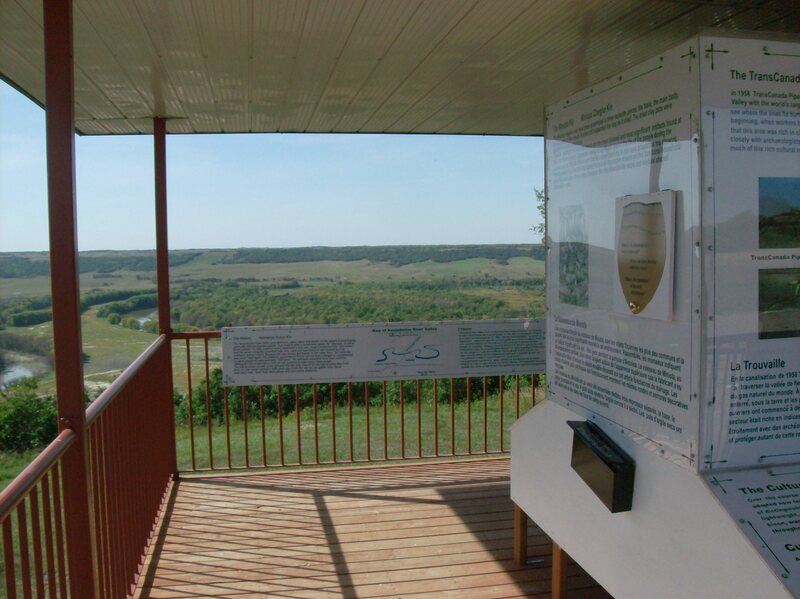 Called Wakpa Tanka Lookout, the site provides a panoramic view of the river valley, which includes an oxbow of the Assiniboine. 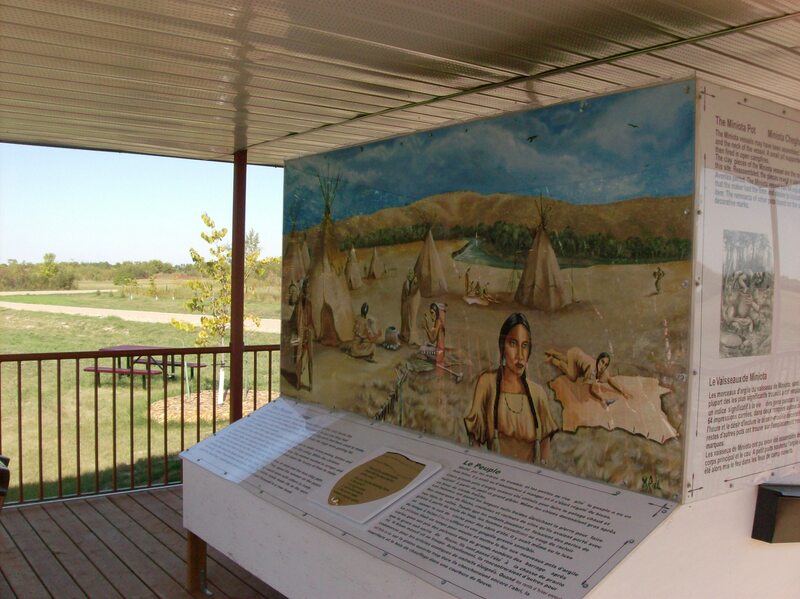 Translated from Dakota, Wakpa Tanka means “great river.” A sturdy well-constructed kiosk provides written and pictoral background on the site’s history and details about the grand valley view before you. 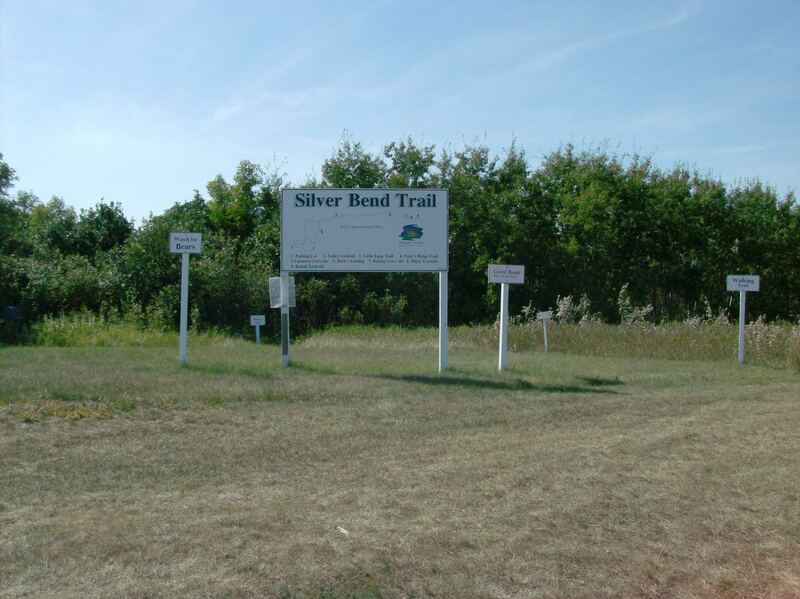 Also at the site is the trailhead for the Silver Bend Trail, a trail with exceptional vistas of the Assiniboine valley. 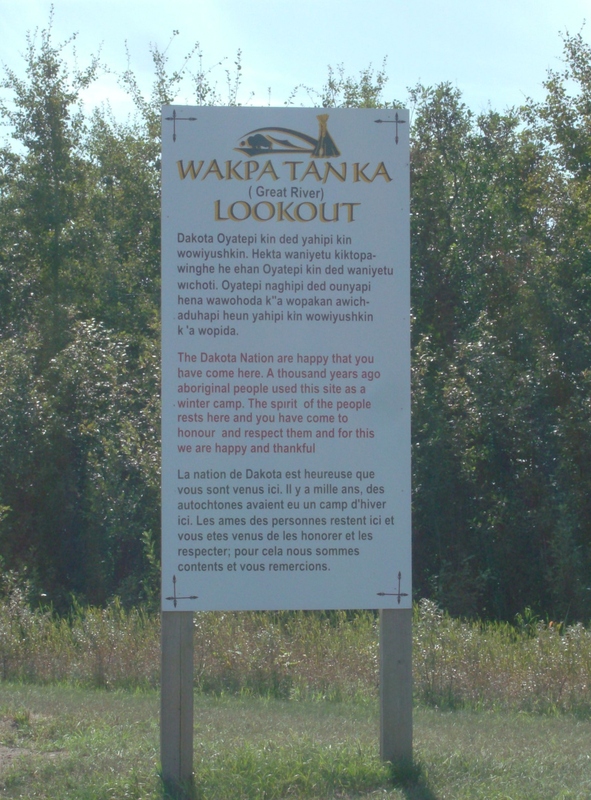 Signage along the trail speaks of aboriginal peoples and settlers offering insight into their daily lives. Steamboats plied the river delivering supplies to settlements along the banks. The site is easy to find. 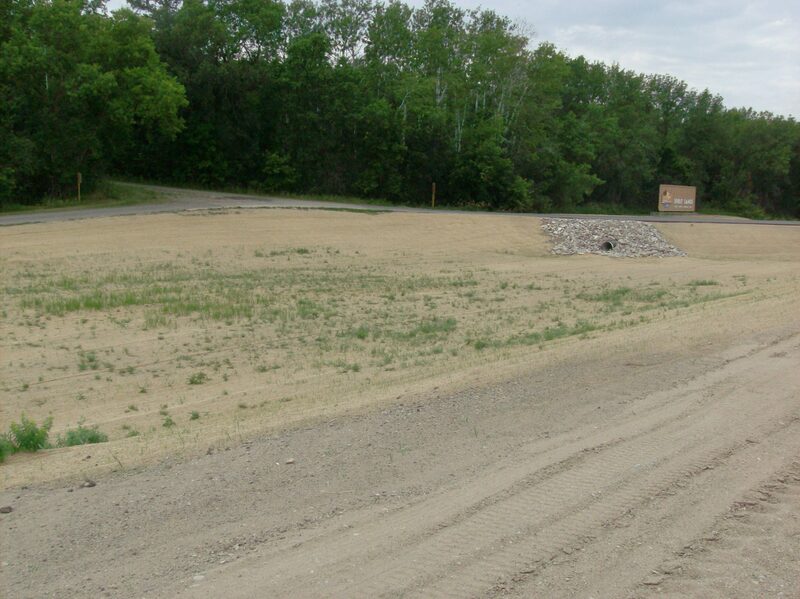 Access to the trailhead and Wakpa Tanka Lookout is off Hwy #83 about a mile and a half north of Miniota. 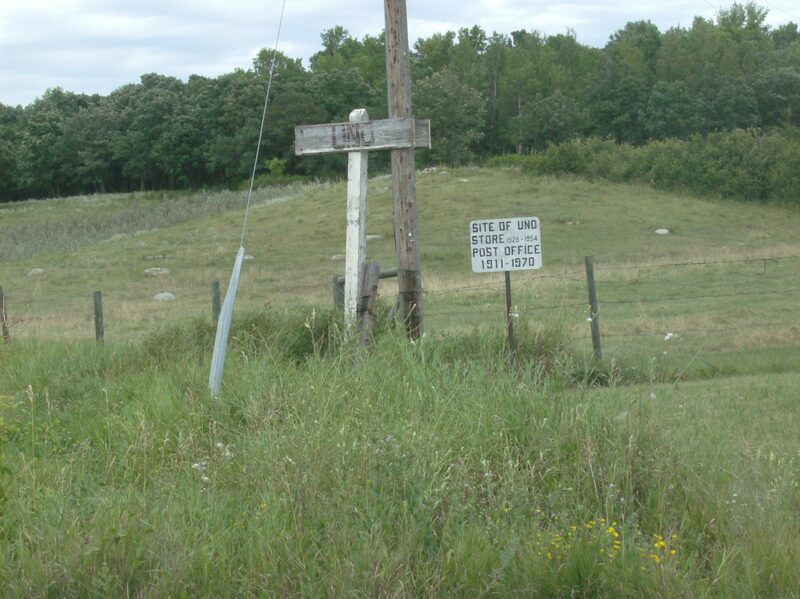 By the highway is a sign for Silver Bend Trail. Turn west onto a good gravel road, drive over a small wooden trestle bridge and into the site. 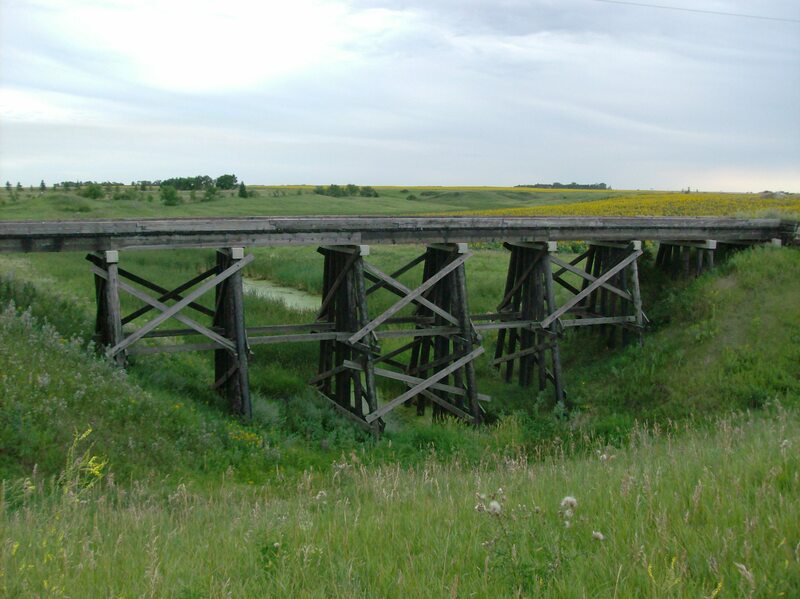 This trestle bridge, which spans CNR tracks, is a rarity in Manitoba as it is completely constructed of wood, even the driving surface. Most Manitobans know we live on a flood plain due to the regular reminders of our rivers. Many don’t know that we live on a lake bottom, Lake Agassiz to be exact, which accounts for the flatness of the land. For several thousand years this massive lake harboured the meltwater from glaciers, some of them a mile and half thick, that covered the province during the last Ice Age which lasted about 85,000 years. Other than the thousands of lakes that dot the province, most of them remnants of Lake Agassiz, we still have a few beaches remaining to remind us of the huge glacial lake. In eastern Manitoba there is evidence of various lakewater levels along the edge of the Canadian Shield. 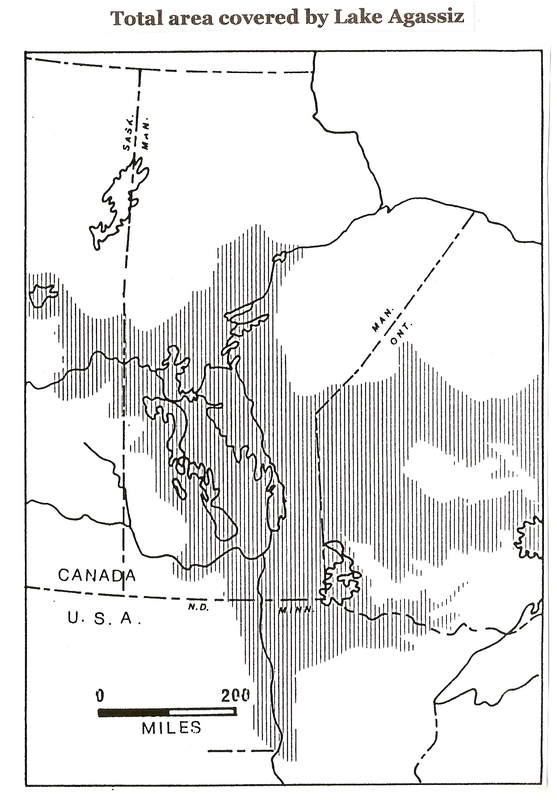 In the western part of the province, the Manitoba Escarpment formed the boundary of the big lake. There still remain a few places where the beaches of the lake are visible. You can clearly see evidence of numerous levels of the lake on the Arden Ridge off Hwy #16. Spirit Sands in Spruce Woods Provincial Park is, in fact, the delta of a huge river that drained meltwater into Lake Agassiz at that spot. Around Riding Mountain National Park there are still beach ridges visible. The park offers a short hike that takes you along the ridges. 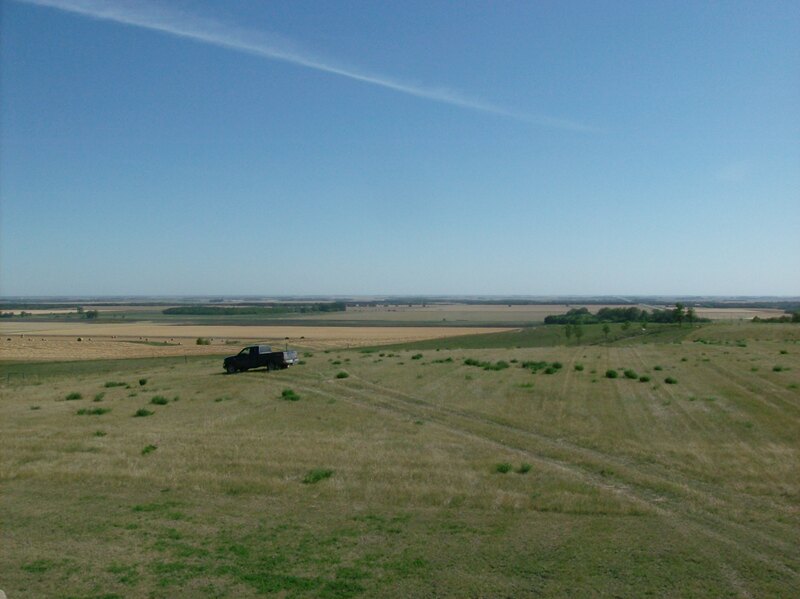 Just a few miles west of Miami, MB as you climb up the Manitoba Escarpment on Hwy #23, an opportunity to drink in the vistas of the old lake bottom has been created. 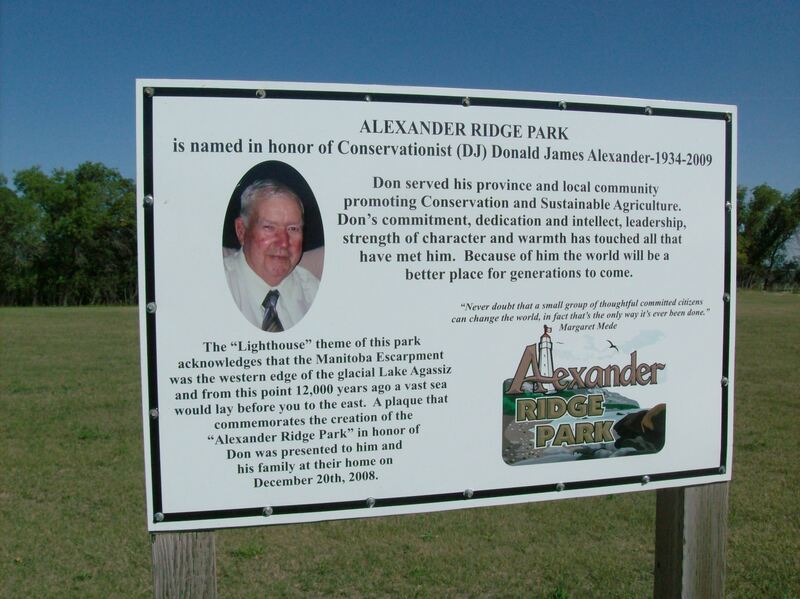 Called Alexander Ridge Park and located almost at the top of the escarpment, the site features grand views of the flatland below and a satisfying roadside stop. 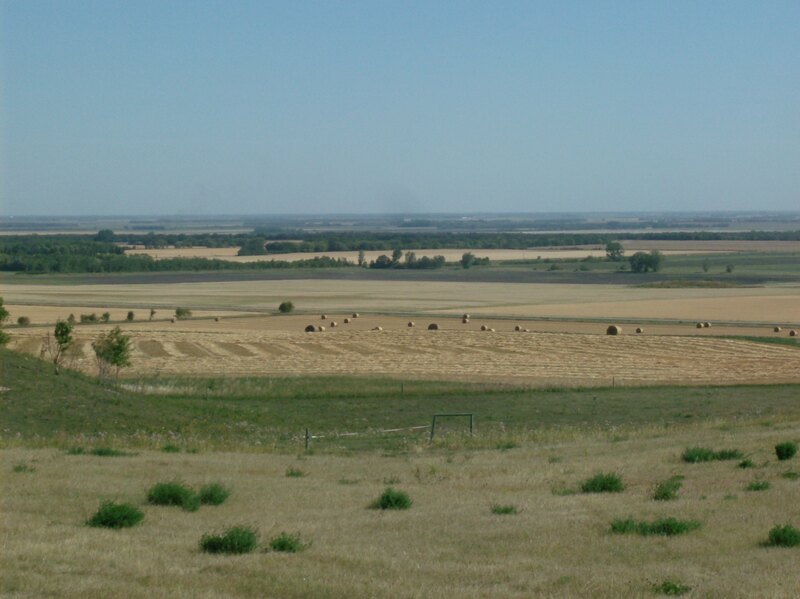 The top picture is one of the long views of the plains below offered from the park. 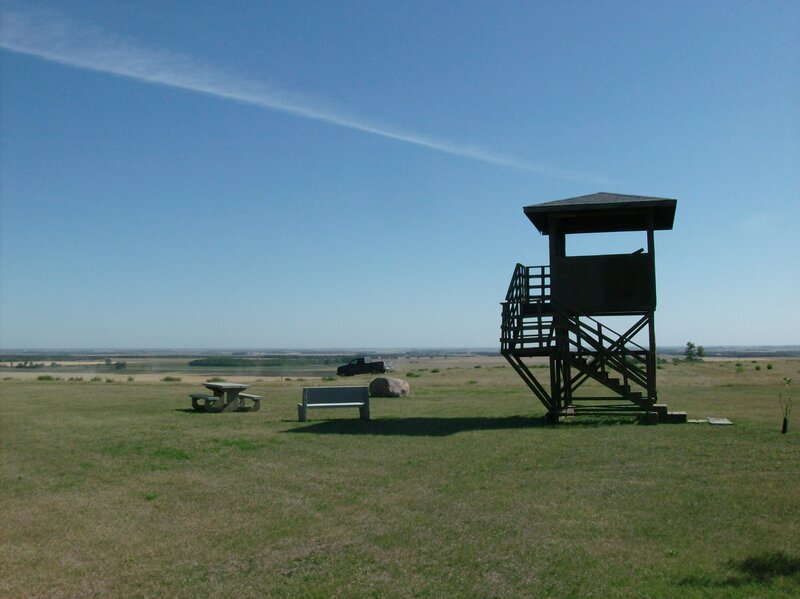 Signage explains the origins of the park and its lighthouse theme, picnic tables await and a wooden lookout tower enhances your 20-mile view of the plains. 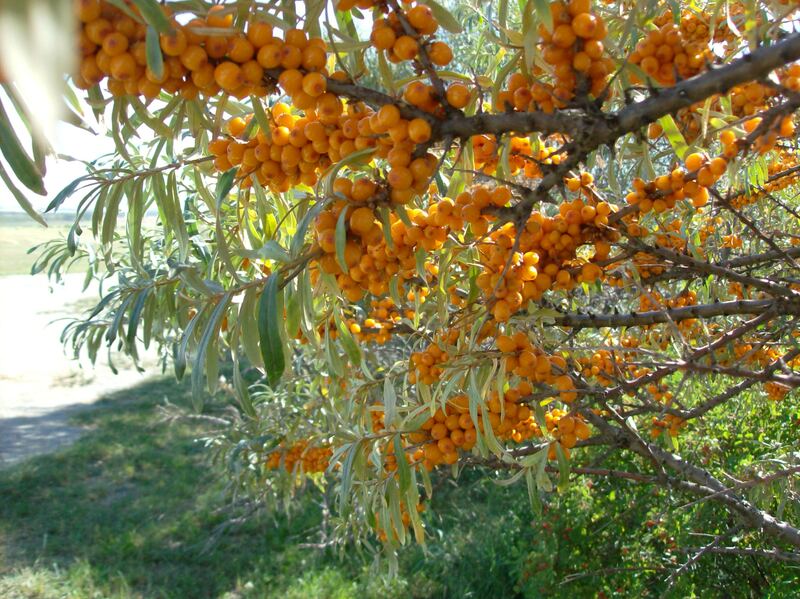 Several Sea Buckthorn bushes flourish in the well-maintained park. Last fall they were loaded with bright orange berries. 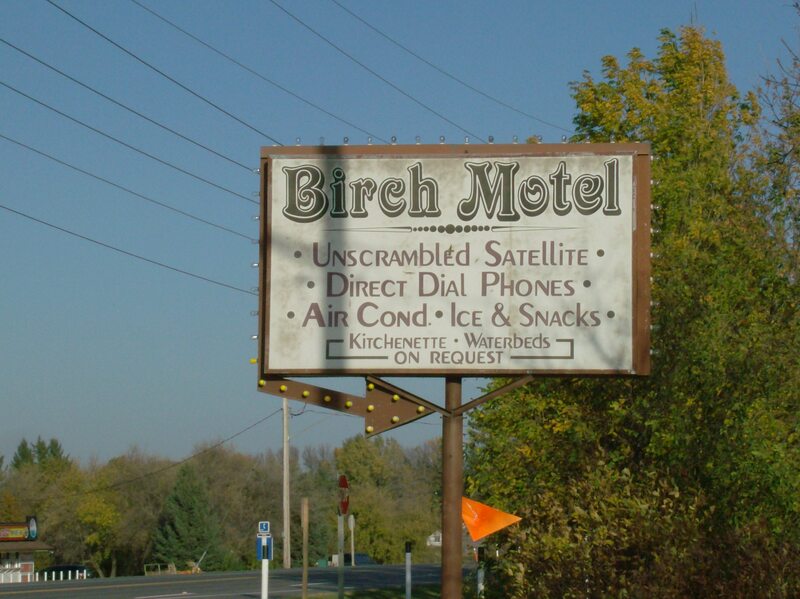 A worthwhile roadside stop but you have to be vigilant to find it. 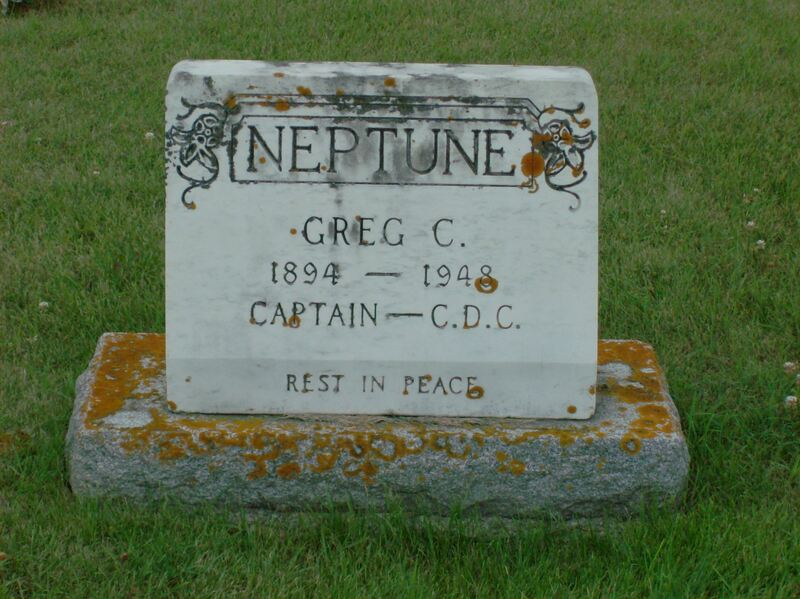 Located on the north side of Hwy #23 is a large sign with a lighthouse on it that identifies the park but you have to doubleback on a side road to get into the place. Flood Update: The Bridge Will Swing Again! One of the victims of last spring’s devastating floods in Manitoba was the world renowned swinging bridge in Souris. The river of the same name that flows through the town threatened to flood the area repeatedly. Flooding was minimized by vigilance and miles of earthen dikes but, as a precaution, the swinging bridge was cut loose and captured, lest it wipe out sections of the dikes. It was recently announced that the bridge will be reconstructed. Souris Town Council has hired Stantec Engineering to come up with the conceptual design for the reconstructed swinging bridge. The bridge has been rebuilt before, most recently in 1976. 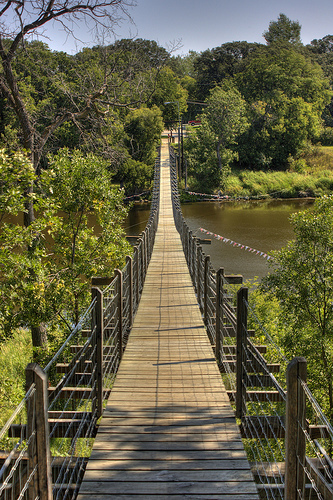 Details about the bridge and this year’s experience are on my short video called Souris Swinging Bridge Before & After. On a related note, River Watch is an international organization of students, teachers and citizens who monitor the water quality of rivers and streams in their area. Students at Souris schools are participating in the program with a special eye on the Souris River which flows through the centre of town and ravaged the valley last spring. Find River Watch info. 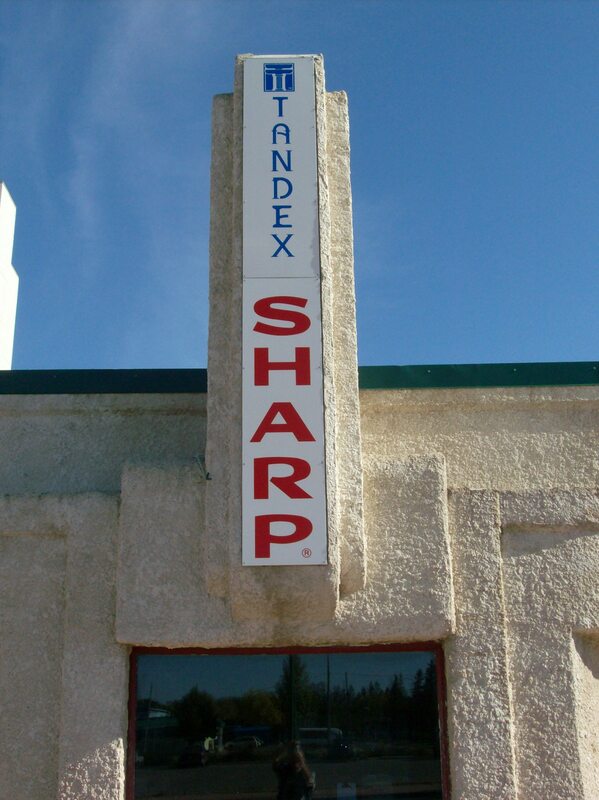 An hour west of Winnipeg on Hwy #2, the little village of Cypress River has developed an interesting roadside stop. 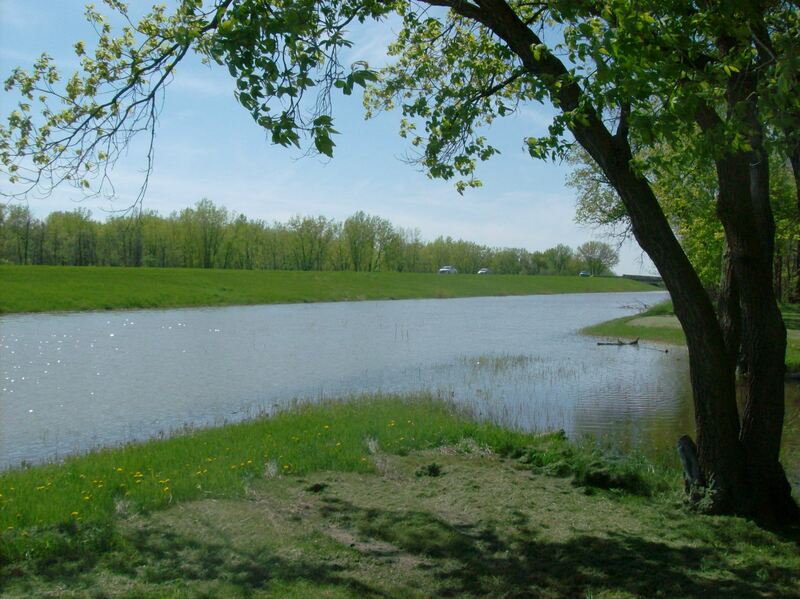 Pleasant amenities are augmented by a well-built boardwalk through the wetlands that surround the small park. Helpful signage along the way explains why we need wetlands and offers local information. It’s a hot summer day. Click the pic to stroll the boardwalk. This is a sample of my first batch of 2011 travel pictures. 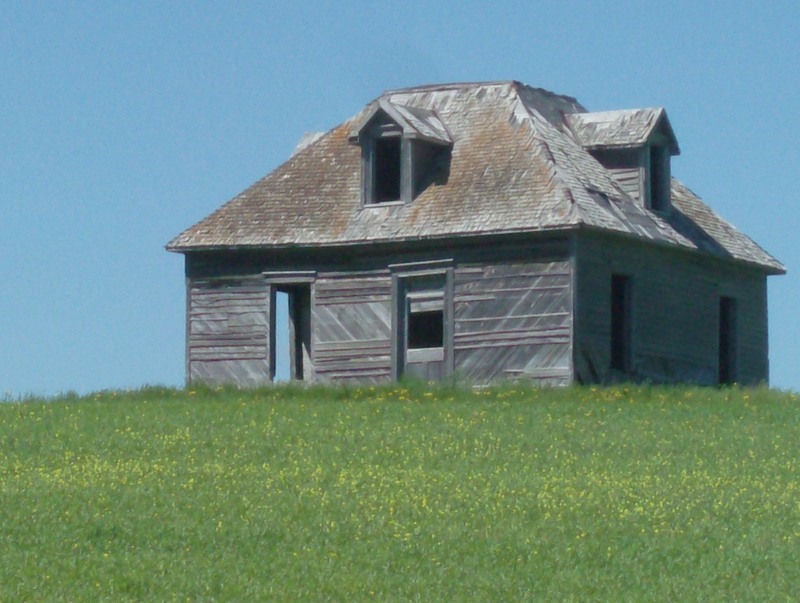 Taken in the Big Muddy in southern Saskatchewan, an enduring symbol of hard pioneer life still stands atop a rise surrounded by crop. I have uploaded the first 56 pictures from my various travels over the spring and summer onto the DickToolCo page on Flickr. They include shots of Vancouver in the spring, a series of cityscapes of downtown Winnipeg taken from the rooftop of the Fort Garry Hotel in mid-May, flood pictures of Brandon, Melita and the flood protest rally held at the Manitoba Legislature in June. During Doors Open I took a series of pictures of the Ukrainian Labour Temple in north Winnipeg. I always snapped pictures during my many trips to Souris covering the flood. Plus several shots from my July travels in Saskatchewan. Some of the pictures are along the right hand sidebar on my blog. All my pictures are here. Enjoy! The drama, the diesel and the dust! A few Sundays back I grabbed this CNR fast freight heading east into Winnipeg. Its rhythms are hypnotic. Meet you at the crossing. One of my day trips this week was east into Whiteshell Provincial Park with a visit to Bannock Point Petroforms and a stop at Rainbow Falls. Lake and river levels are low at this time of year so the falls was a mere shadow of its spring and summer self but the surrounding forest glowed bright with autumn hues. 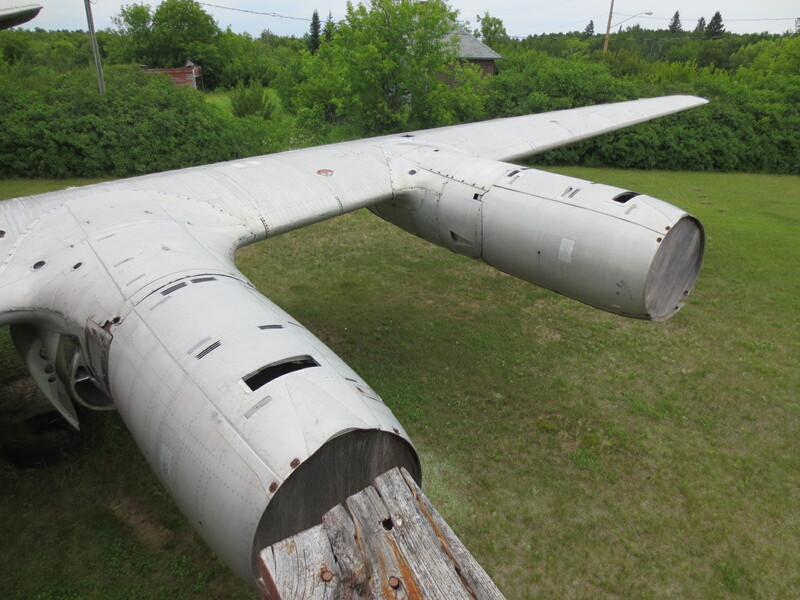 What do Kodak Brownie cameras, bullet trains, Spartan radios and the Central S building in Shoal Lake have in common? 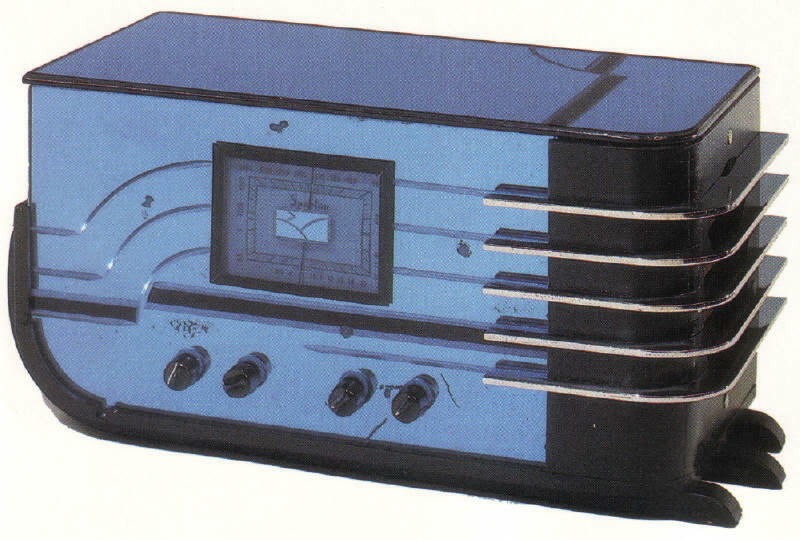 The answer: the same person, an innovative American industrial designer named Walter Dorwin Teague, designed them all. 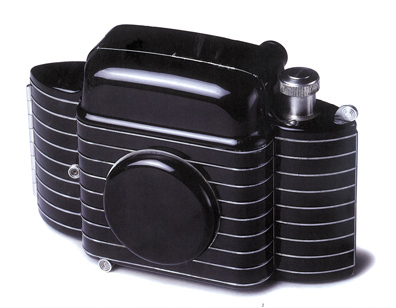 Teague’s most popular camera design for Eastman Kodak was the Bantam Special. Perfection! From Pendleton, IN Teague worked as an illustrator and commercial artist, notably for Time magazine. A trip to Paris in 1926 exposed him to new ultra-modern designs and materials that captured his imagination. 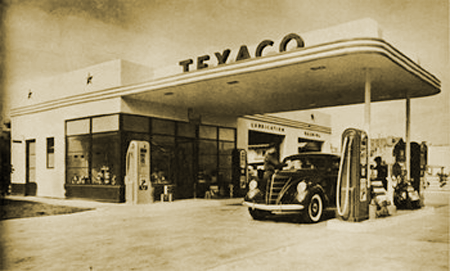 Hired by Texaco to design service stations, Teague employed architectural elements from the Art Deco and Art Moderne schools. 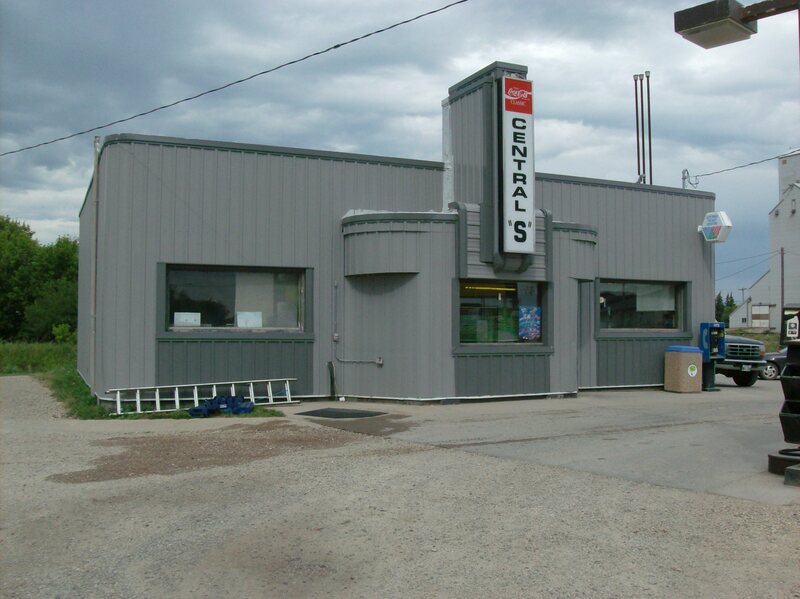 The Central S building is a classic example of this style and one of the few remaining in western Canada. 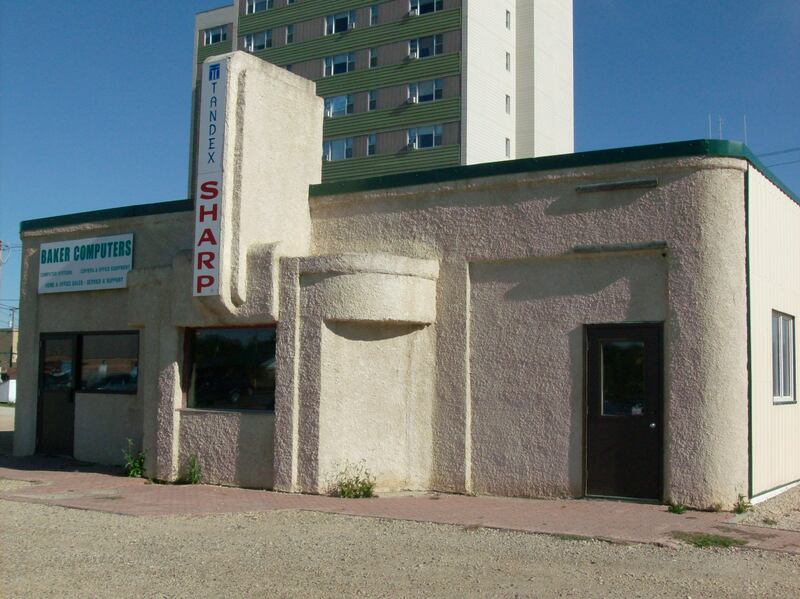 The building, on prime real estate at the intersection of Highways 21 and 42 in the centre of Shoal Lake, was constructed in 1936. It opened for business on July 31 of that year as the Red Indian Filling Station, the brand name used by the Frontenac Oil Company. Formed in 1873, the McColl-Anderson Oil Company in Toronto consisted of a refinery and lubricating oil and grease facility. Around the turn of the century, they shortened the name to McColl Brothers. A merger with Frontenac Oil in 1927 gave the McColl-Frontenac Oil Company Canadian operations from coast to coast. About this time, Texaco began acquiring shares in Frontenac, gaining control of the company in the early 1930s. 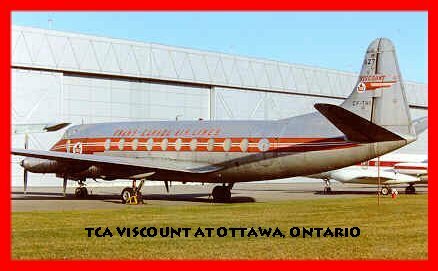 In 1941, they formally changed the name to Texaco and the brand to Sky Chief and Fire Chief products. 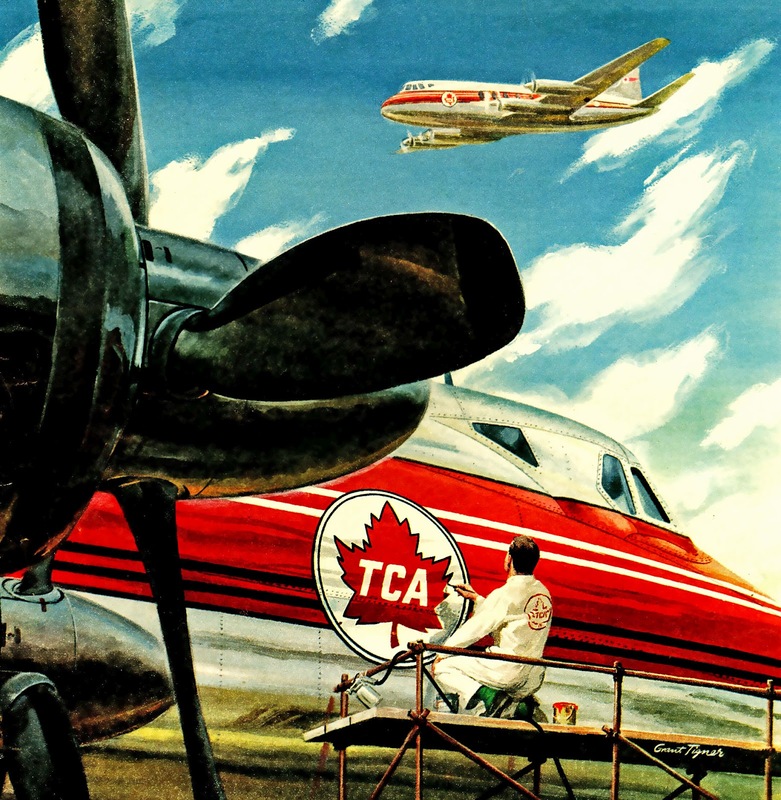 Texaco service stations became a common site along highways all over North America. 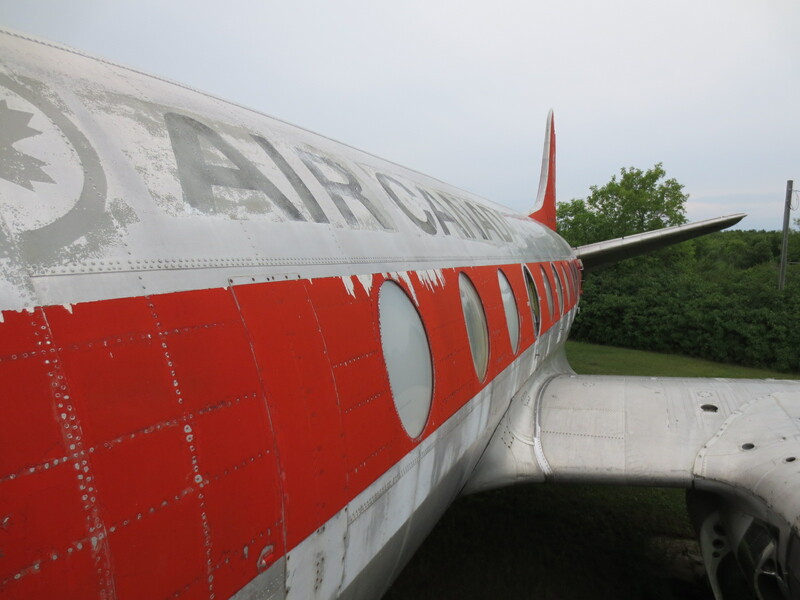 Unmistakable they had bright white stucco finishes, forest-green stripes and large red three-dimensional stars around the upper area below the roof along with a freestanding signpost bearing the red Texaco star logo on a white disk. 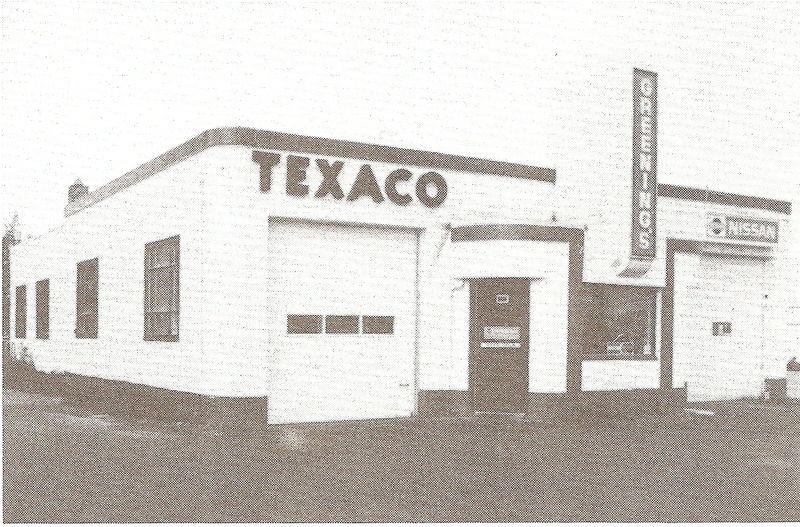 Teague created two designs for Texaco service stations: a small one like the Shoal Lake building, and a larger example with a breezeway supported by angled pillars that covered the pump area. 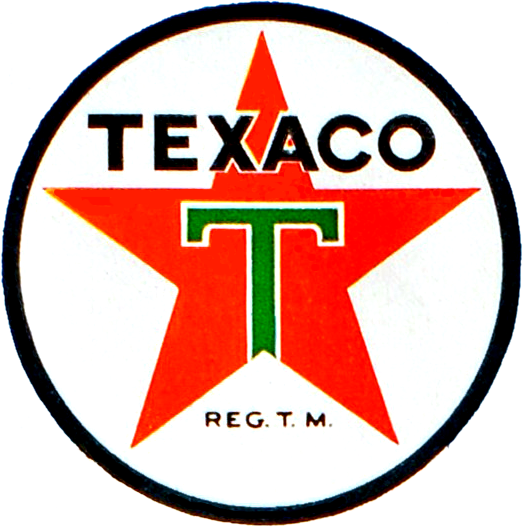 The prominent decorative detail was the large, 3-D red star taken from the Texaco logo and duplicated on the company’s uniforms, prompting the advertising slogan “You can trust your car to the man who wears the star.” There were about 10,000 such service stations on the continent by 1950, most of them in one of Teague’s two cookie-cutter styles. 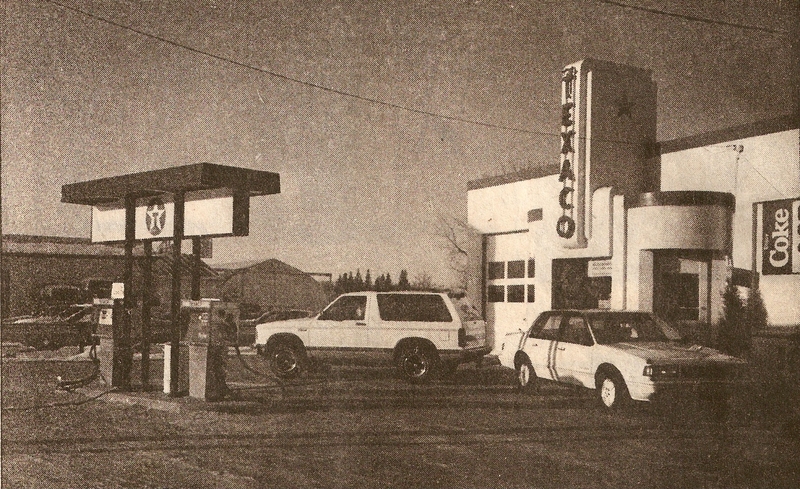 The large version of Teague’s Texaco stations with breezeway. 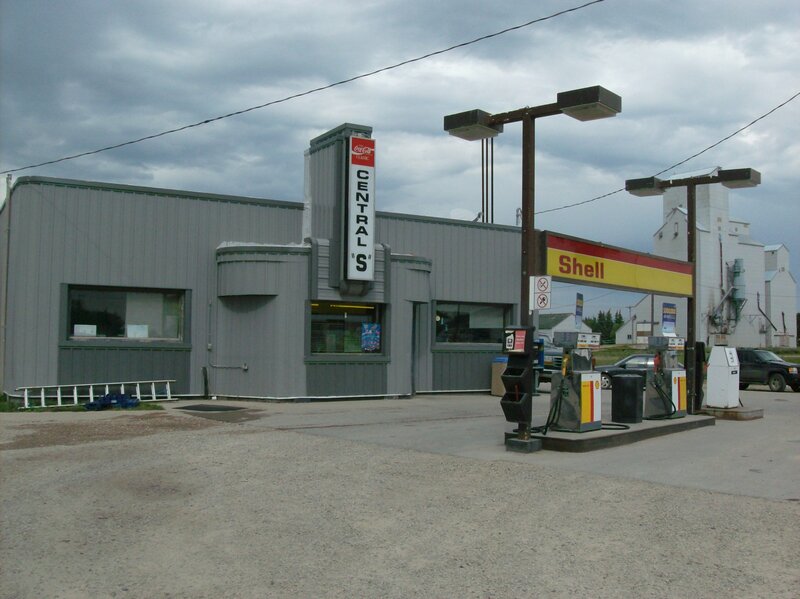 Owned by Texaco until 1953, the service station was leased to Dean Brothers, Mr. Burns, Roy Garlick, McLean’s, Mr. Kashton, Louis Bart and John Byram. 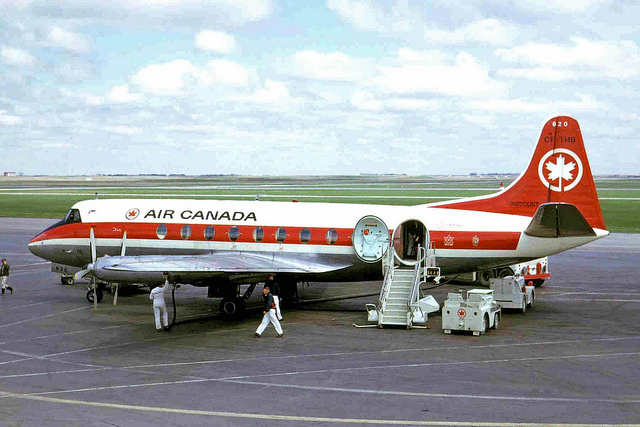 It was bought in 1953 by John Decelle who operated it until 1960. The small furnace room at the back was added on during this time. Roy Garlick ran it for a few years, followed by Doug Susinski, Don Wiburg and Bill Schwaluk. 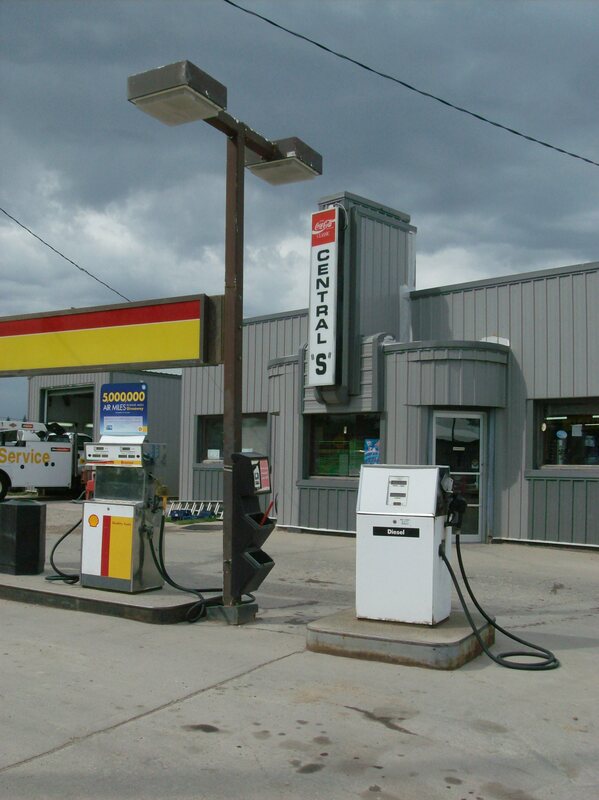 With the absorption of Texaco into Chevron, Bill Stebnicki bought the building in 1987 and it became the Central S convenience store. Today Mickey and Yvonne Shust are the proprietors. I recently took pictures of how the structure looks these days. Even though it is completely covered in grey vertical cladding, almost every detail from its original design can still be seen on the building. The rounded corners on the building, the roof and entrance, the prominent stepped signage, the symmetrical windows where the garage doors were, the darker trim at the cornice and around the projecting sign, all still visible, all smooth and optimistic, all telling you that the future is bright! 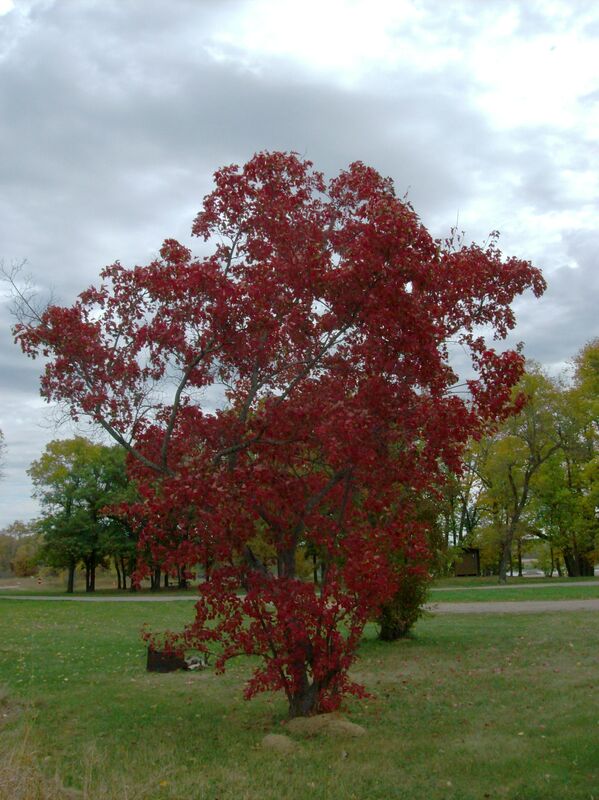 Despite the matching grey Manitoba sky beyond, the colour has a warm, an inviting neutrality. I had forgotten that the building isn’t square on the lot. “It’s squee gee,” as Mom would say. It doesn’t parallel the facing street, The Drive, but tilts slightly toward the intersecting Station Road, Shoal Lake’s main drag. Rarified 21st century mists of Art Moderne still lurk about the old place, passing along pleasing reminders of gentler, less-pre-occupied times to anyone who can slow down and notice them. Take a deep Art Moderne breath, old friend. You’ve earned it. As a fine example of Art Moderne architecture, the building stands among a dwindling number of such historic places left in Canada. Its geometric form, precise location for striking visual appeal and the renown of its creator conspire to make this a little treasure worthy of preserving. 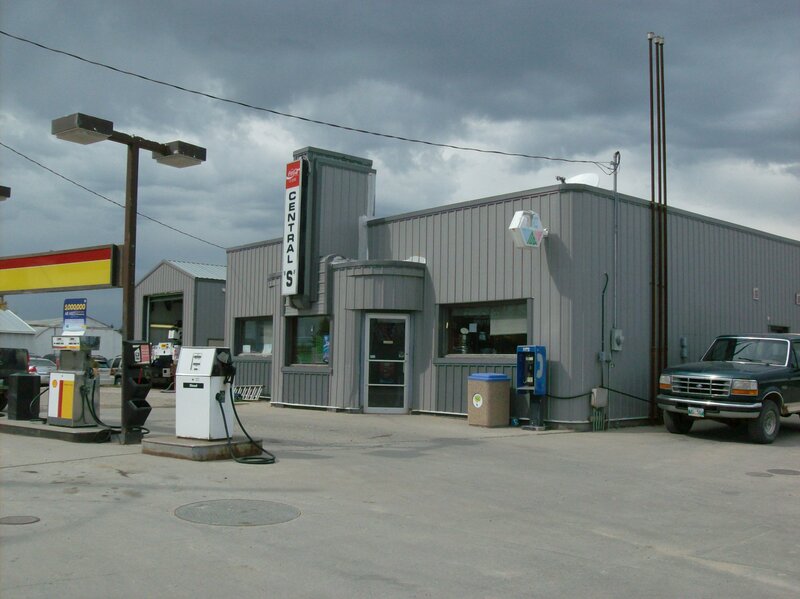 I’ve known about it for years and finally got around to photographing a twin to Shoal Lake’s service station, this one in Dauphin, MB also designed by Teague. 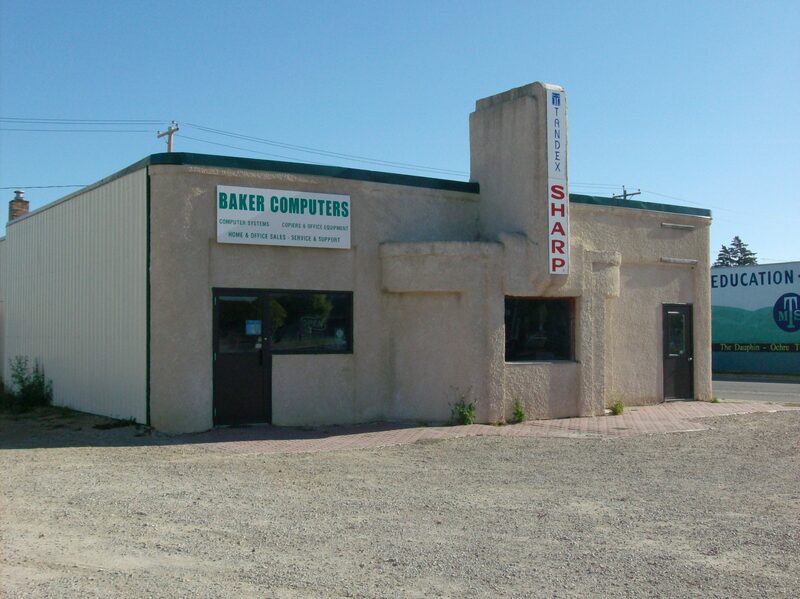 Built in 1936 and formerly Greening’s Garage it now houses a computer business. The sweeping sign with the rounded receding corners prominent at the front, the flat roof, the horizontal lines, and sleek, sensuous curves of the building overall suggest movement and speed to match the modern automobiles. 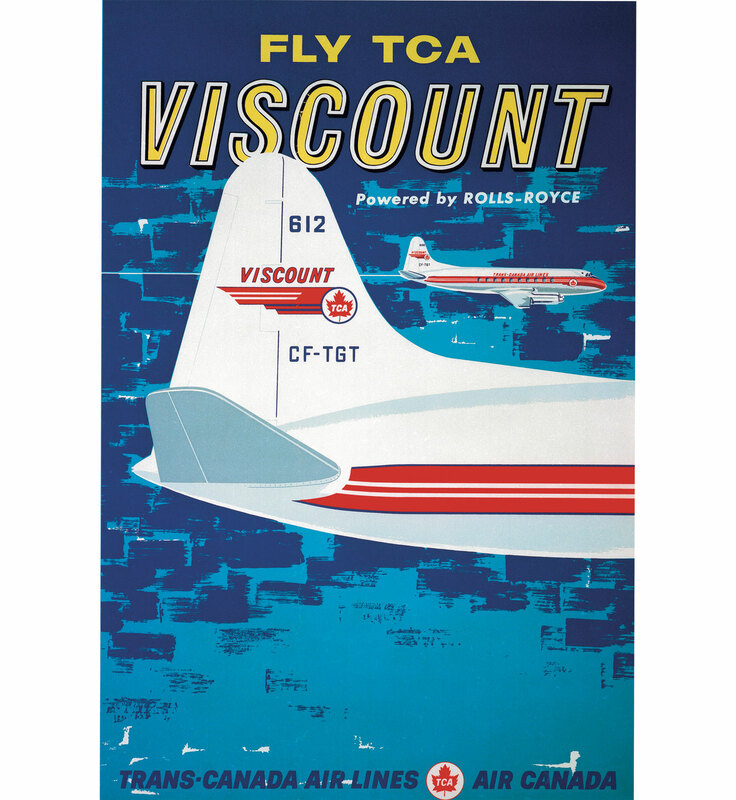 All this is evident in the Texaco picture, the same as the Shoal Lake version. Today most of the openings have been closed and the place stuccoed but the sign is still the same. 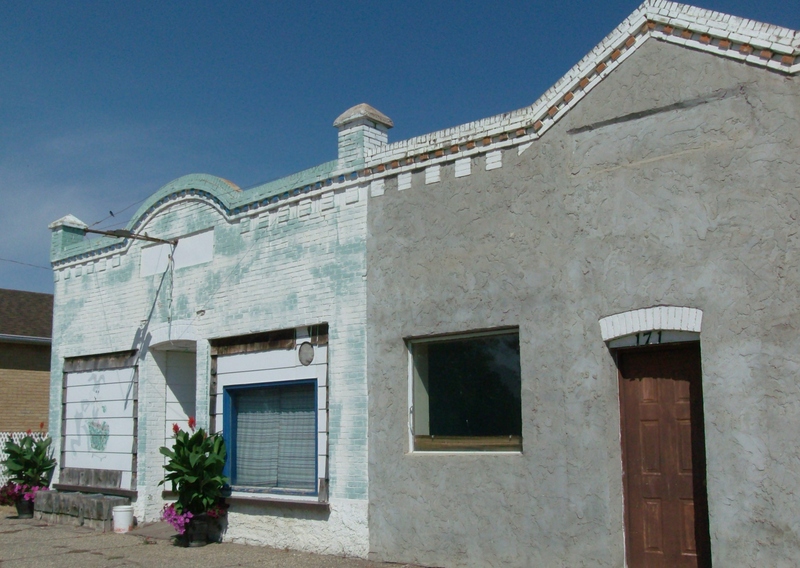 Although covered over, the rounded front entrance remains intact and the paint job kept the horizontal stripe along the roofline, two distinctive elements of the style. Originally set back from the street to accommodate gas pumps, without the pumps it still stands out positioned on a street corner. 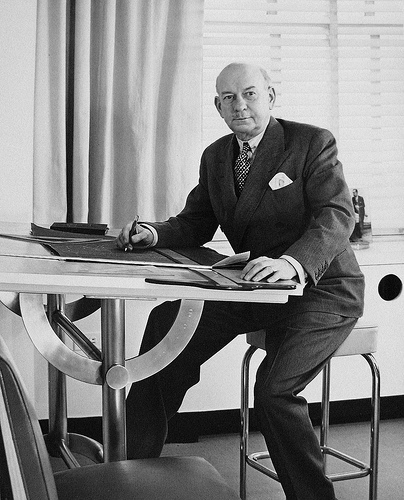 By the way, the company Walter Teague started in 1926 is still going strong today creating innovative and award-winning industrial design. In a farmer’s field I saw an eagle tearing into the carcass of a stranded fish, just one of thousands of outwash fish delivered by flooding rivers into pools of water that evaporated, leaving them to die. Flooded ditches are now the scene of slowly dying fish, suffocating in the disappearing water. 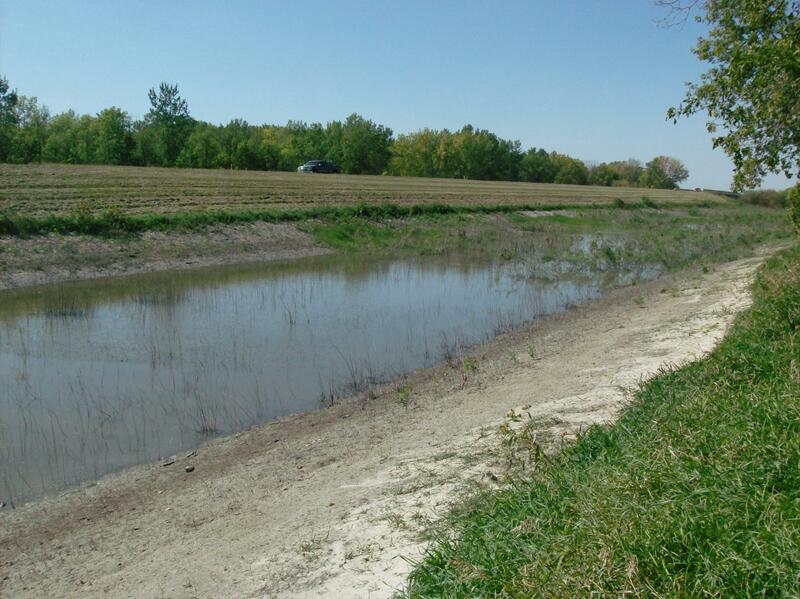 This first picture is a flooded ditch along the Trans Canada Highway east of Portage la Prairie right next to the Assiniboine River taken in May. The second picture is the same ditch today. I saw several gasping fish slowly swimming in the shallow water last week. At Marsh Lake in Spruce Woods Park I saw only one painted turtle sunning on a downed log. In past years there would be dozens of turtles in the sunshine. 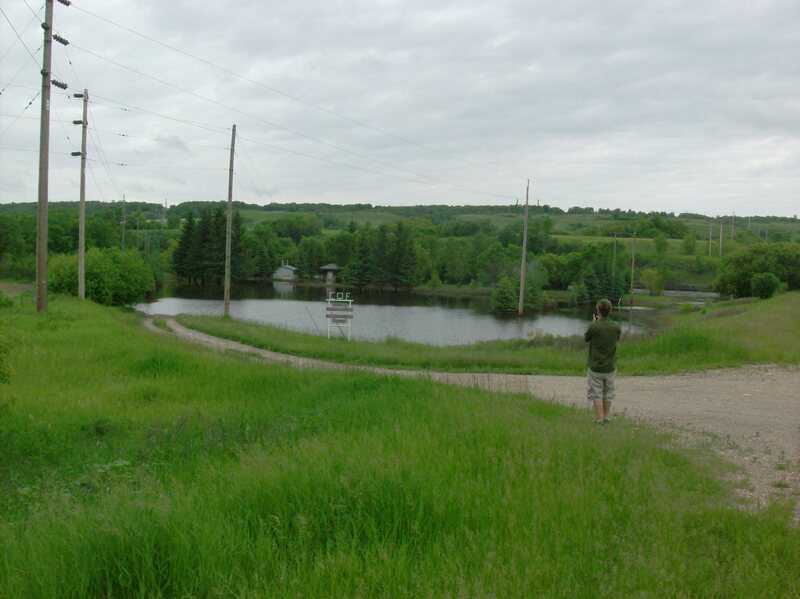 The Assiniboine River inundated Marsh Lake, which is an oxbow, changing the habitat of the lake substantially. It will be several years before the lake rebounds from the flood and hopefully the turtle population will survive. Every time I passed through the Assiniboine Valley this summer I was surprised by the amount and vast distribution of flood cake, the grey rind left behind by the flooding, now cracking and broken in the late summer heat. Whole valleys are white from the stuff with little black soil in sight. 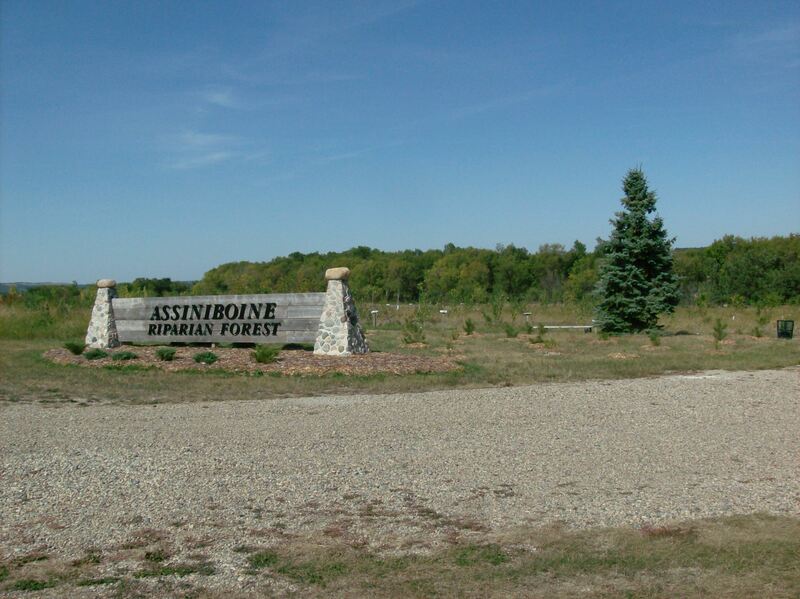 In the Assiniboine Valley along Hwy 83 south of Miniota is a recently planted arboretum known as the Assiniboine Riparian Forest. I reported on it on my Day Tripper page. The arboretum sits on the valley floor and I was concerned the river may have washed the whole thing away. I was pleasantly surprised to see little damage to the trees and pathways with just a couple of rows of trees having evidence of flooding. Overall it survived the inundation well, however, the surrounding farm land was thick and white with flood cake. 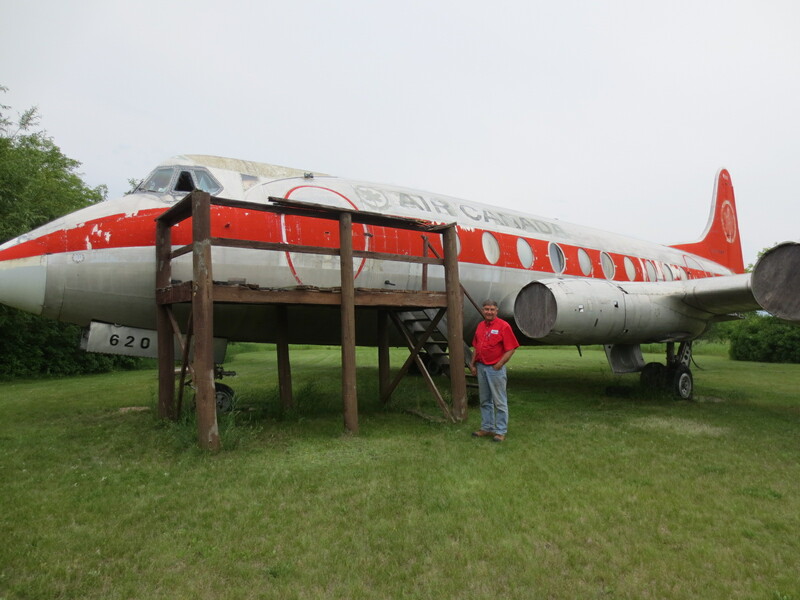 Heading into fall, Manitoba has thoroughly dried out in many places with others still covered in standing water. The next two weeks promise to be dry so more moisture will disappear from the land. We could use a thirsty spring that soaks up the excess water next year. 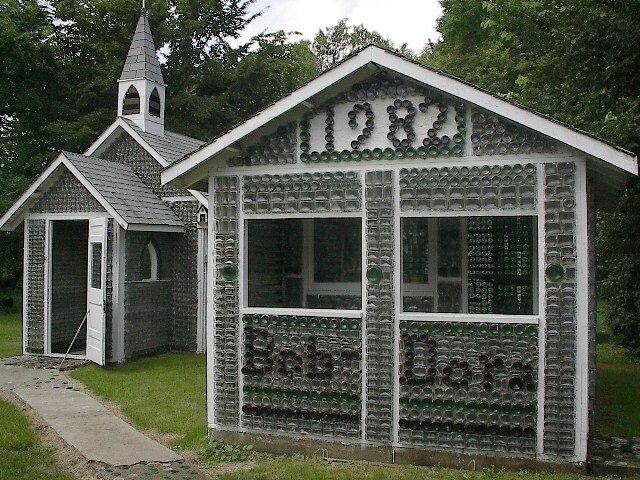 In 1982, Bob and Dora Cain along with Fred Harp created a bottle house using 4000 bottles out on the Cain farm near Treherne, MB. That was only the beginning of their bottle ideas. The uniqueness of the project has resulted in a small bottle village relocated to downtown Treherne on Hwy #2. There is a house, church, well and working restroom, all made of bottles! Let me take you on a guided video tour of the bottle buildings.